Following by only two days Bonhams high-end auction at its New Bond Street headquarters Olympia is an opportunity to move some more mainstream and affordable collector cars. And that is exactly what happened, with the results that follow. After covering the Bond Street auction, Chris Sharpe proceeded to Olympia where he remarkably reported on pretty much every one of the 77 cars in the sale. Chris, who in earlier years wrenched his VSCC father’s Bentleys and Healey Silverstone, is a CNC Engineer at Rolls-Royce who just finished self-restoring, including bodywork and paint, an MG B GT. In other words, he knows his way around old cars. His insights and observations are informed and his contribution is the first time in years that I’ve been able to create an onsite-based report on a UK auction. I hope you enjoy the joint report that follows, and further hope Chris isn’t frazzled from this experience and will come back for more later in 2019. There are no blockbuster transactions here, but noteworthy were the seemingly irrational results for the Bullitt-replica Mustang and the Excalibur SS, results that bear no relation at all to what these American-origin vehicles would bring in the States. The cars that follow are sorted by lot number. 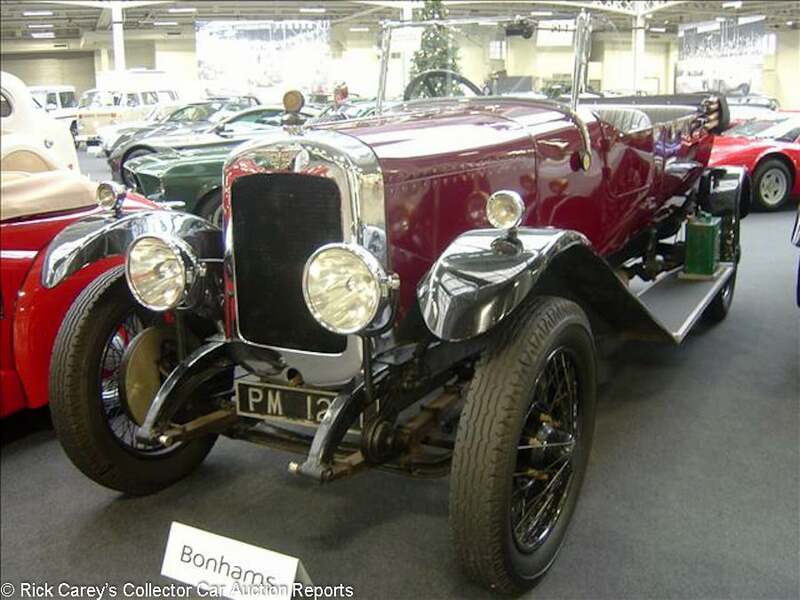 The photos are small, 640×480 pixels, except those sourced from Bonhams website. Lot # 101 1970 Mercedes-Benz 250 4-Dr. Sedan; S/N 11401022030153; Black/Brown vinyl; Estimate $7,645 – $10,194; Older restoration, 3- condition; No Reserve; Hammered Sold at $1,147 plus commission of 15.00%; Final Price $1,319. – Automatic, Euro headlights, wheel covers. – Resprayed some time ago, exterior trim not updated. Interior original and worn. Dirty old engine compartment. A car of no particular appeal except as a beater. 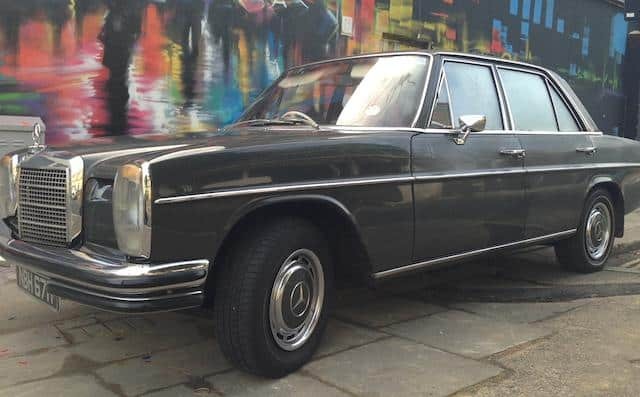 – Even the allure of being offered without reserve wasn’t sufficient to make the bidders rise to the bait for this Mercedes who paid parts car money for it, exactly what it deserved. 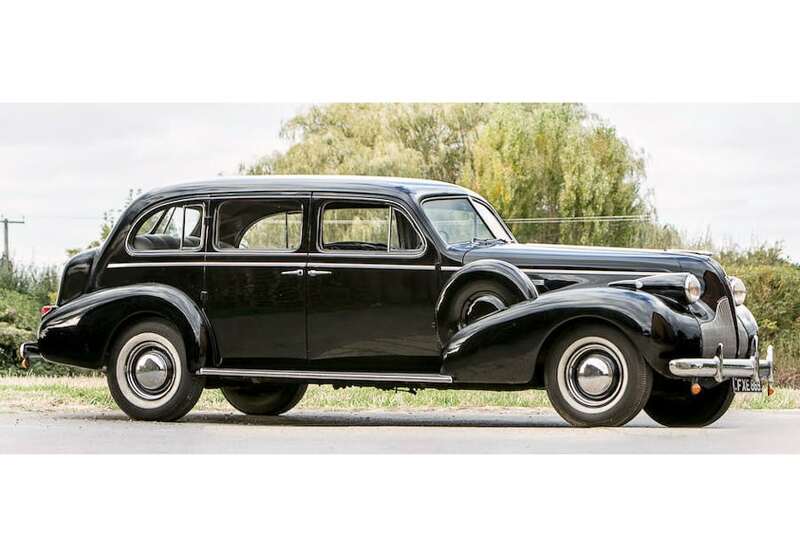 Lot # 102 1950 Daimler DE27 Limousine, Body by Hooper; S/N D51074; White, Black/Black leather, Red velour; Estimate $10,194 – $15,290; Older restoration, 3- condition; No Reserve; Not sold at Hammer bid of $1,402. – Driving lights, hubcaps. – Original condition. Interior, black leather front seats, red velour rear seats and poorly trimmed too. Resprayed some time ago. Presentable and said to run and drive but aged, neglected and needs everything. – Offered without reserve but not reported sold by Bonhams although it would appear to have attracted at least one bid. Maybe the successful bidder got a second look at it and fled the premises before paying. 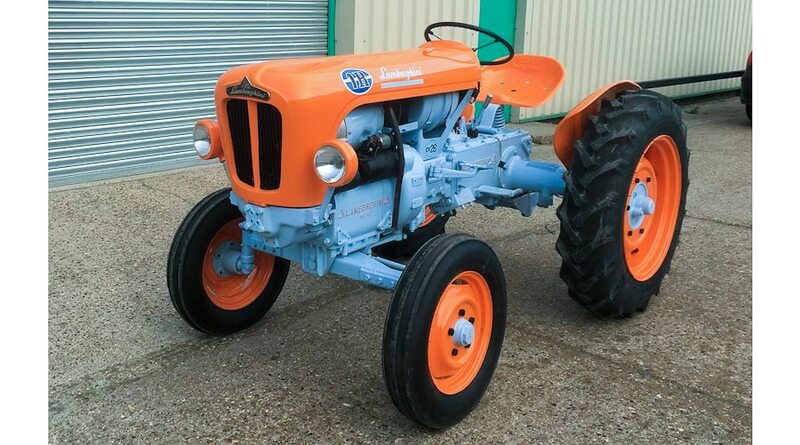 Lot # 103 1962 Lamborghini 1R Tractor; S/N FL211505; Orange, Blue /; Estimate $17,839 – $25,484; Older restoration, 3+ condition; With Reserve; Not sold at Hammer bid of $9,557. – Orange wheels, 2-speed transfer case – Bright paint work, some mechanical work would need checking but makes a good first impression despite some faded gauge faces. – A novelty purchase that is worth more to a Lamborghini automobile owner than to the small estate where it would actually be useful. To judge from this bid, Lamborghini owners were outnumbered by practical and thrifty small estate owners. This isn’t enough for this tractor. 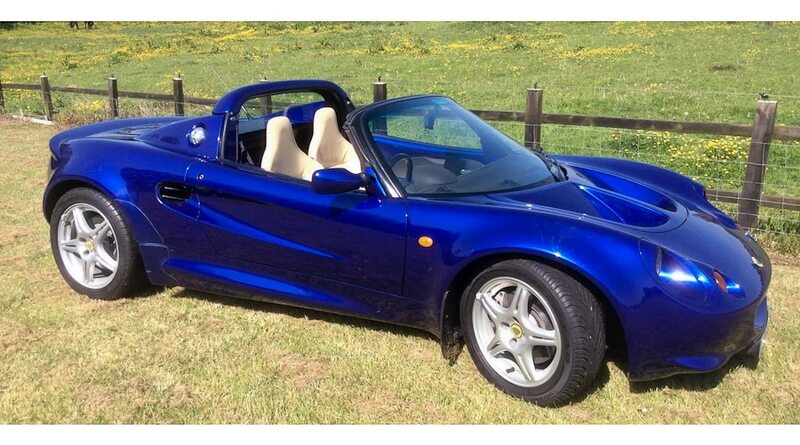 Lot # 104 1997 Lotus Elise S1 Roadster; S/N SCCGA1110WHC32067; Metallic Blue/Beige; Black vinyl top; Estimate $15,290 – $19,113; Older restoration, 3- condition; With Reserve; Not sold at Hammer bid of $9,557. – RHD. alloy wheels, CD stereo, 5-speed, car cover – Original condition. Slightly aged wheels and paintwork. Interior wearing well. It could benefit from an update but is more than good enough to drive and enjoy. – This is a ridiculously quick little roller skate but it is worth more than a Mazda MX-5 Miata would bring in comparable condition and this is MX-5 money. Lot # 106 1964 Fiat 500D Transformabile; S/N 645131; White/Red vinyl; Black top; Estimate $12,742 – $19,113; Unrestored original, 3 condition; With Reserve; Not sold at Hammer bid of $11,468. – White wall tyres, suicide doors. – Average paint and interior, could easily be improved but appropriate for a Fiat 500. A good base point to improve on. 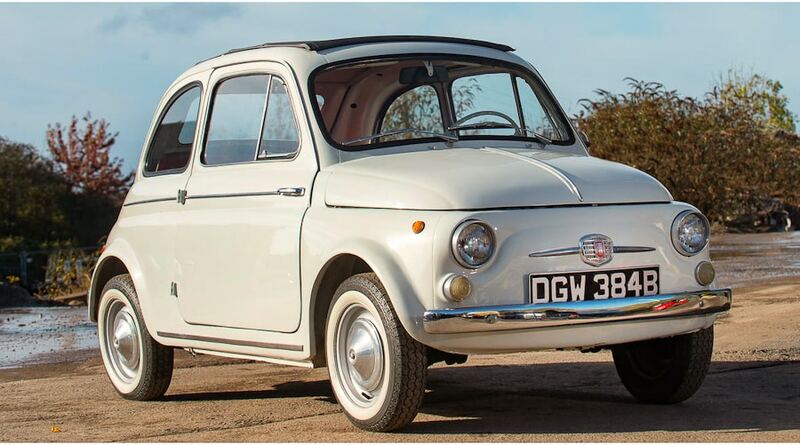 – The reported high bid, unless it came from one of Olympia’s overhead lighting fixtures, should have been sufficient to see this cute but ordinary Fiat on its way to a new home. 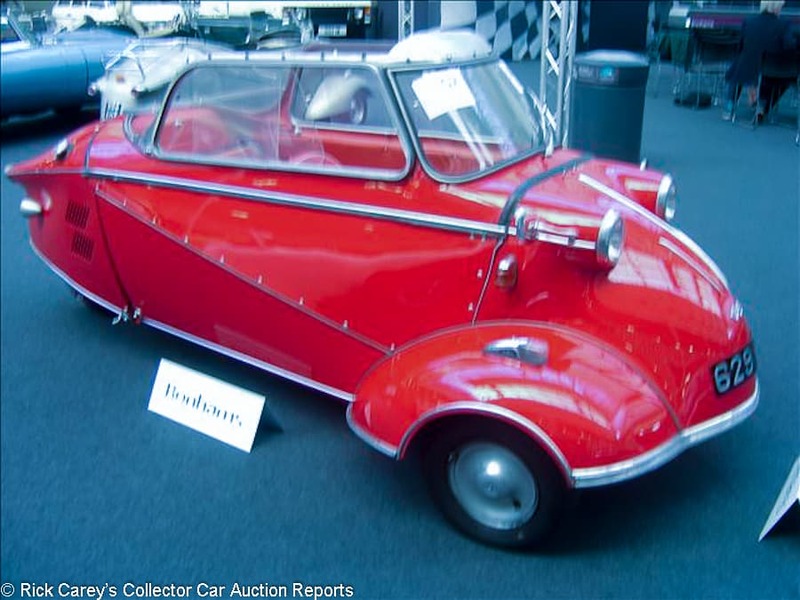 Lot # 107 1959 Messerschmitt KR200 Roadster; S/N 70843; Red/Red vinyl; Black cloth top; Estimate $22,936 – $28,032; Older restoration, 3 condition; With Reserve; Hammered Sold at $16,066 plus commission of 15.00%; Final Price $18,476. – Silver steel wheels, blackwalls, outside mirrors, side curtains. – Some paint imperfections but generally usable and presentable as shown. An older restored Kabinenroller in sound and usable condition. – This is a post-block sale that is a good value for the new owner. Spiffed up a little and shipped economically to the States for the 2019 Monterey auctions and it should bring a tidy profit. Lot # 108 1966 Jensen Interceptor Coupe, Body by Vignale; S/N 1152517; Red/Red leather; Estimate $12,742 – $17,839; Unrestored original, 5 condition; With Reserve; Not sold at Hammer bid of $12,487. – RHD. Power steering, automatic, alloy wheels. – Needs full restoration. Big areas of corrosion. Front and rear bulkhead intact but will need major structural work. Exterior needs panels replaced. Tattered original upholstery. Otherwise complete. 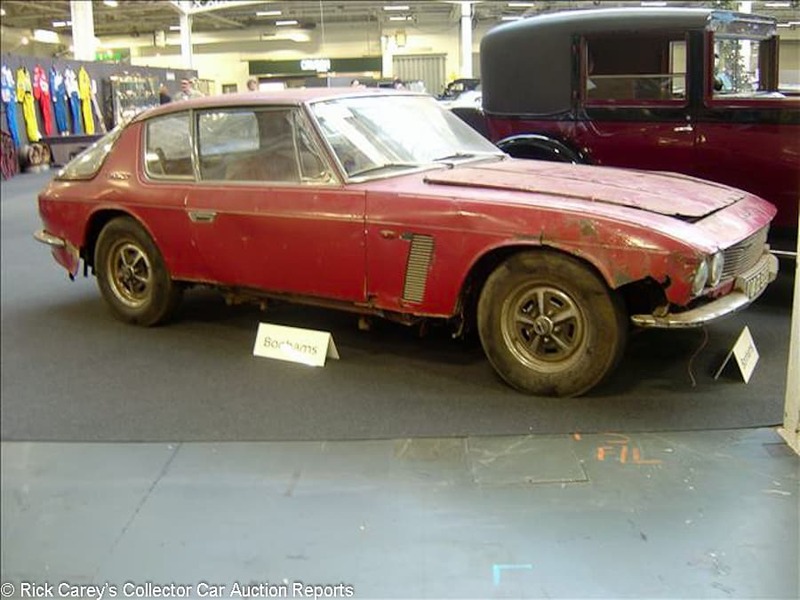 – “Rotten” only begins to describe this decrepit Jensen but its stature as one of the first 17 Interceptors built by Vignale before the coachwork began to be made by Jensen makes its restoration more likely. It is a daunting project, enough to put the Olympia bidders off, although if there was money just GBP 200 under the low estimate the deal should have been consummated. 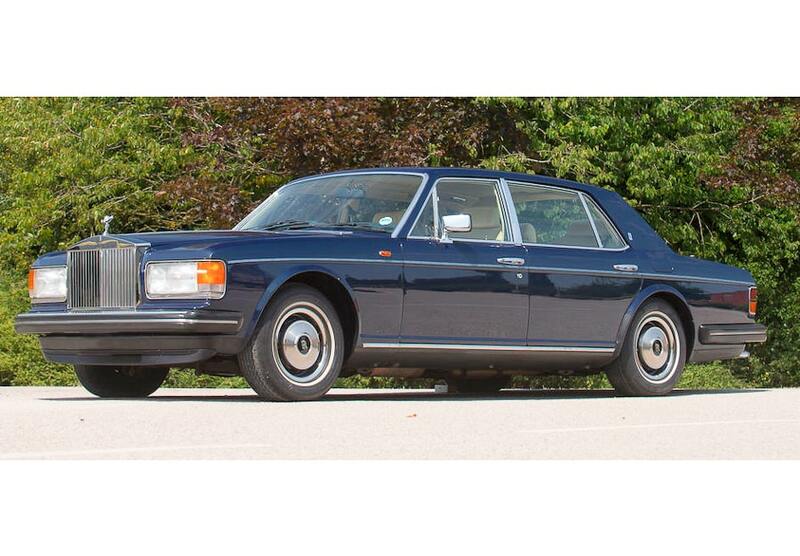 Lot # 109 1985 Rolls-Royce Silver Spur Centenary Limousine; S/N SCAZN0004FCH14000; Black/Cream leather; Estimate $38,226 – $50,968; Older restoration, 2- condition; With Reserve; Not sold at Hammer bid of $31,855. – RHD. 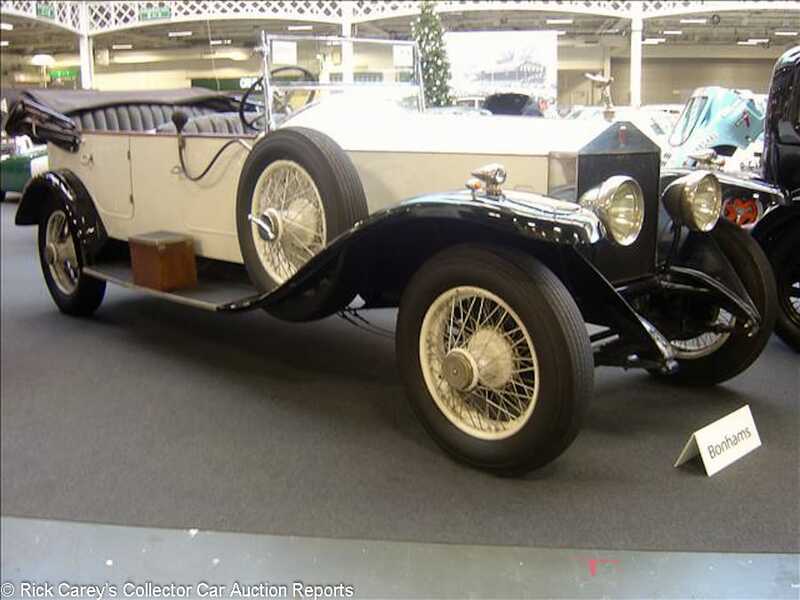 Automatic, loaded with options and accessories – This car was retained by the factory being the 100,000th Rolls-Royce made. Numerous nonstandard features, used by R-REC Chairman. Good paint, cream leather is very well kept, Very straight original and clean car. Clearly maintained by R-R. – Offered three months ago at the Goodwood Revival, it failed to sell there on a reported bid of $64,670 (GBP 50,000). With a severely adjusted pre-sale estimate here it again fell short, setting up a quandary for the Heritage Collection. It’s a lot of Rolls-Royce, but no one seems to care. 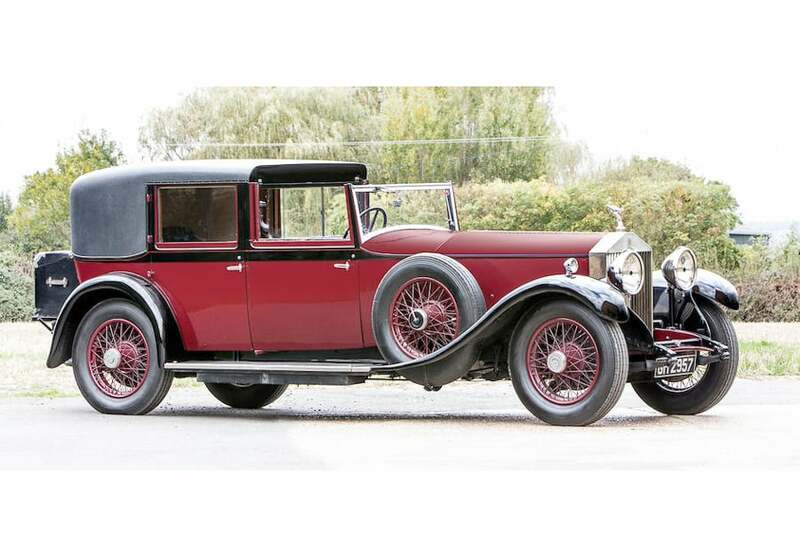 Lot # 111 1930 Rolls-Royce 40/50hp Phantom II Sedanca deVille, Body by Hooper; S/N 29GY; Engine # YK45; Burgundy, Black fenders and padded roof/Black, Brown leather; Estimate $82,823 – $95,565; Older restoration, 3 condition; No Reserve; Hammered Sold at $85,371 plus commission of 15.00%; Final Price $98,177. – RHD. Jump seats, dual sidemounts, luggage trunk, sliding tendelet, Rose wire wheels, sliding division, smoker’s kit and vanity. – Original Registration mark. Recognized engine rebuild with new block and cylinder head. The Rose wheels are a bit odd. Driver to rear old style voice tube intercom. Used leather but serviceable, good interior wood trim. A good car that is let down by dull colours. 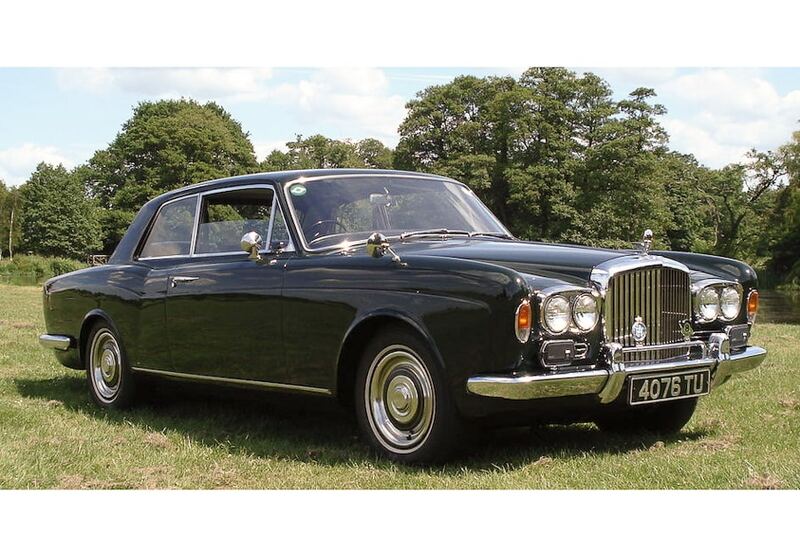 – Bought on a hammer bid just over the low estimate this is a majestic Phantom II. Its Sedanca deVille coachwork is formal, but surprisingly attractive and a sound value at this result. Lot # 112 1939 Buick Super Limousine; S/N 949333366; Black/Black leather, Grey cloth; Estimate $22,936 – $31,855; Older restoration, 3- condition; No Reserve; Hammered Sold at $8,665 plus commission of 15.00%; Final Price $9,964. – RHD, dual enclosed sidemounts, jump seats, turn signals – Resprayed some time ago. Interior is worn, very average and smells musty. – Offered as “Ideal for wedding hire” if that’s the intended use it needs a thorough fumigation before any self-respecting bride will park her gown in these musty seats. At this price, however, quite a lot of work is financially feasible. In 1939 a Buick Super was Cadillac quality. 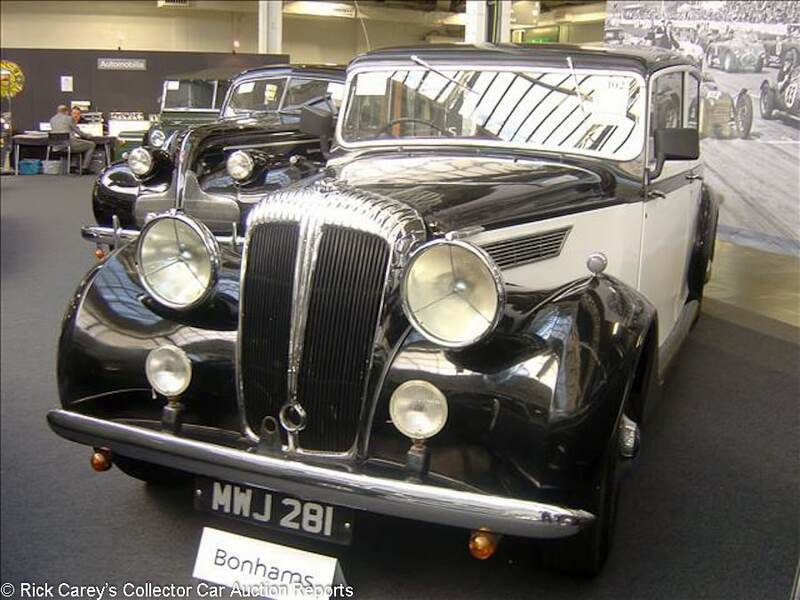 Lot # 114 1936 Talbot BG110 Sports Tourer, Body by Vanden Plas; S/N 4565; Black/Jade Blue leather; Black cloth top; Estimate $114,678 – $165,646; Older restoration, 3+ condition; With Reserve; Hammered Sold at $146,810 plus commission of 15.00%; Final Price $168,832. – RHD. Wire wheels, blackwalls, dip beam light, suicide doors. 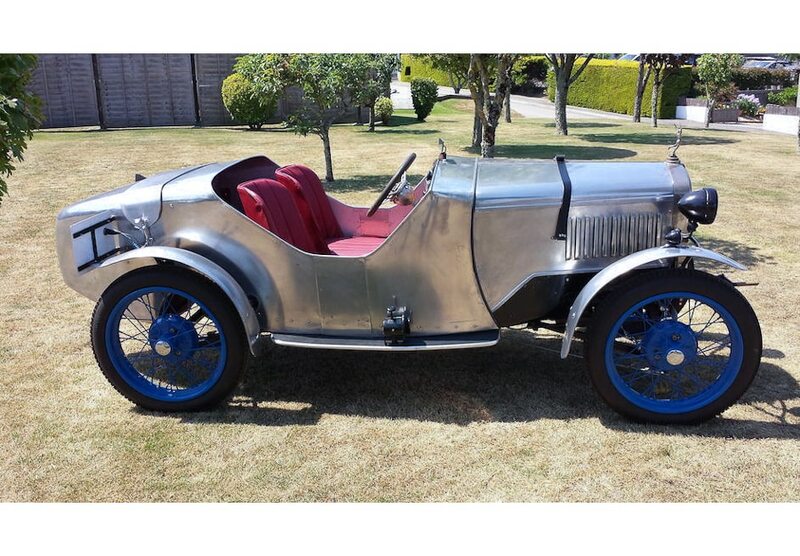 – Restored in the 90’s by Talbot specialist Arthur Archer, only three owners from new. Strange Jade coloured leather seats and door cards are jarring. Black coachwork is average but presentable. So is the chrome. A beautifully proportioned car. All the coachwork line and fenders flow perfectly. A great looker. – This transaction was concluded post-block at a rather substantial premium to the pre-sale low estimate. It has several things going for it including a clear 3-owner history, a quality old restoration that is holding up well and being one of barely more than a dozen built. This is Bentley style and performance for less than a Bentley price. 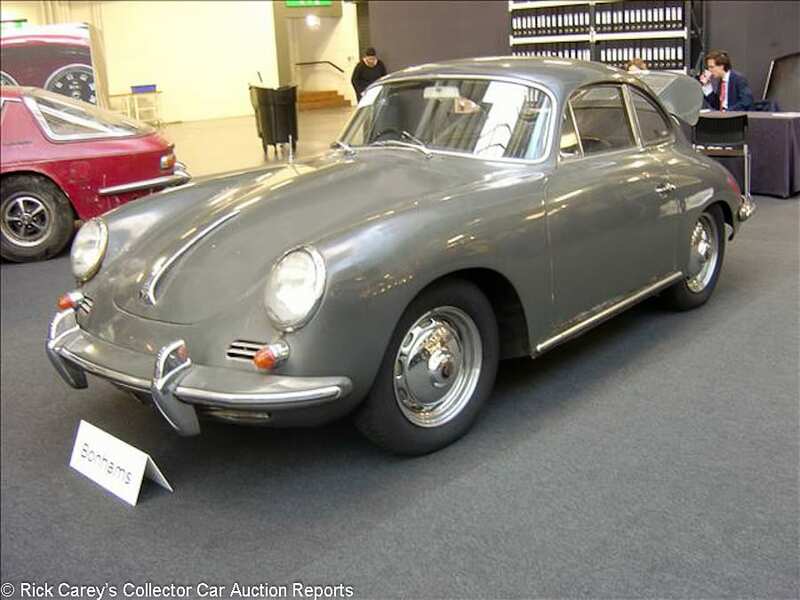 Lot # 116 1962 Porsche 356B Super 90 Coupe, Body by Reutter; S/N 122346; Engine # P806425; Grey/Black vinyl; Estimate $89,194 – $95,565; Unrestored original, 4- condition; With Reserve; Hammered Sold at $76,452 plus commission of 15.00%; Final Price $87,920. – RHD. Chrome wheels, pushbutton radio, VDO clock. – Original and unrestored. Showing exterior rust on panels and underneath, rotten door bottoms and front fender legs. Interior is original and degraded, soft finishes require replacement, missing rear seat cushions and front kick panels. Rusty, pitted interior chrome trim. Mostly all present, so a great honest start point for an upwardly mobile marque but a restoration project nonetheless. – Worth well over $150,000 when it’s done, but there isn’t sufficient headroom left after paying even this sub-low estimate price to get it there. All credit to the new owner if it is restored, but there is going to be a large contribution to preserving Porsche history when all the bills are totted up against the restored car’s value. That’s not uncommon these days, when rotten barn finds often bring magnanimous prices. This price isn’t magnanimous, it’s just generous. 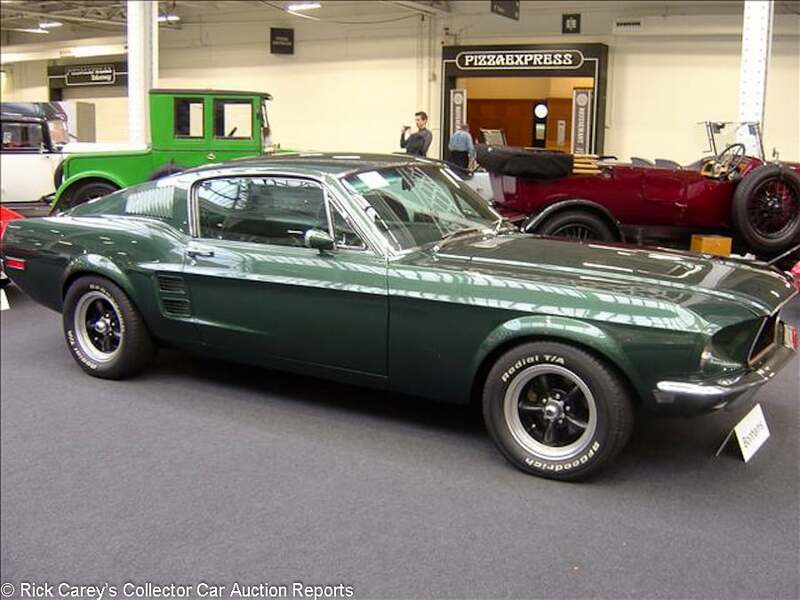 Lot # 118 1967 Ford Mustang ‘Bullitt’ Replica Fastback; S/N 7R02S108099; Highland Green Metallic/Black vinyl; Estimate $89,194 – $114,678; Modified restoration, 3 condition; With Reserve; Hammered Sold at $78,945 plus commission of 15.00%; Final Price $90,787. – RHD. 390/320hp, 4-speed, Torque-Thrust-style wheels, Radial T/A tires, power steering, upgraded engine, transmission, suspension and brakes, Traction-Masters. – Bullitt Recreation. Dark Green paint is poor quality on roof and B-pillar. May need full respray as it’s tough to patch blend metallic paint areas. Aged but orderly engine compartment and interior. The stated chassis number does not match the 7R02S106536 on the fender. – Sold by Bonhams at the Goodwood Revival in 2009 for $52,377 (GBP 32,200 at the time) and at the M-B World auction in 2011 for $52,353 (GBP 33,350 at the time), this result, which is a post-block GBP 71,250, is simply inexplicable, even before considering the VIN mismatch. The buyer better enjoy driving it to recoup even a little bit of the $35,000 too much paid for it. Lot # 119 1953 Aston Martin DB2 Vantage ‘X’ Series Coupe; S/N LML50X4; Dark Green/Biscuit leather; Estimate $165,646 – $203,872; Older restoration, 3- condition; With Reserve; Hammered Sold at $222,985 plus commission of 15.00%; Final Price $256,433. – RHD. Silver wire wheels, driving and fog light, aircraft-style lap belts. – One of five “X” series DB2s built and believed used by Aston for development work before being sold. Once owned by Peter Livanos, used by Sir Stirling and Susie Moss in the 1987 Mille Miglia, then gifted to Elliot Moss in the 80’s and offered here from his ownership. Dirty carpets needs replacing. Displayed for some time at the BMIHT. An older restoration that needs finishing off to improve this car which has not been run in years and is in need of recommissioning. 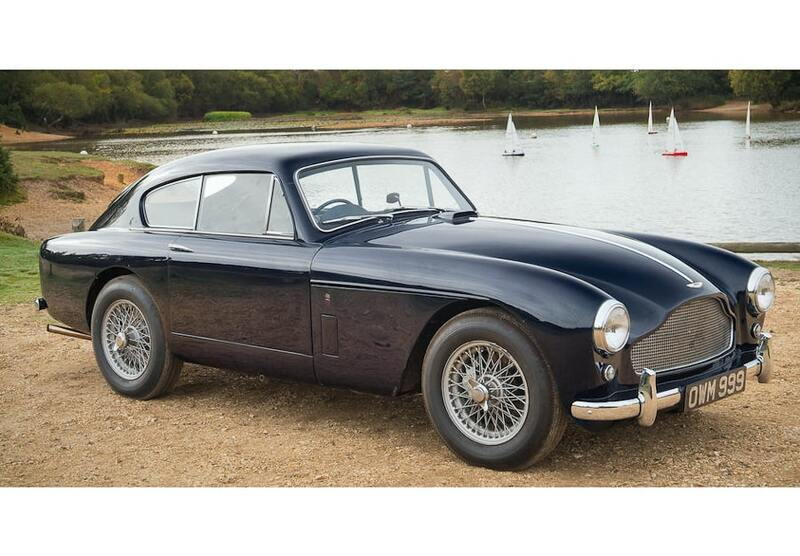 – A rare DB2 with an excellent provenance, the appeal of both being apparent in this above high estimate result. 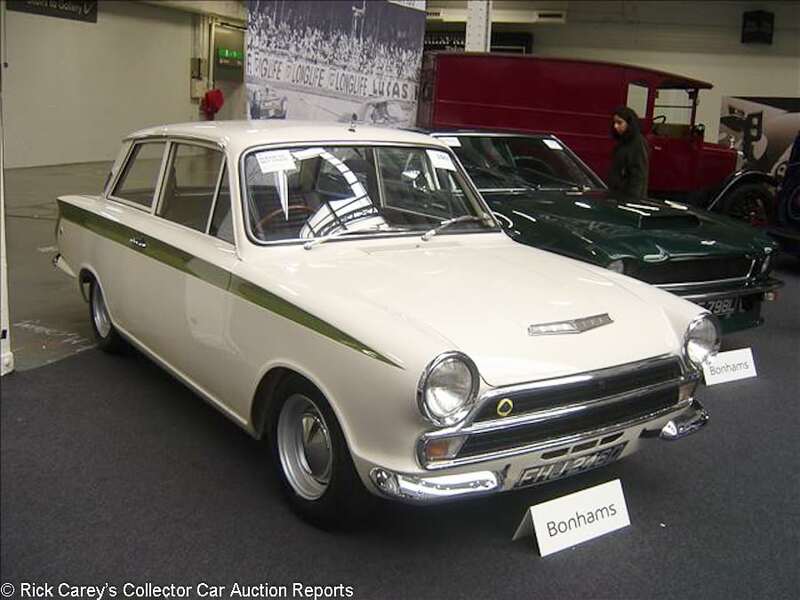 Lot # 120 1965 Ford-Lotus Cortina Competition 2-Dr. Sedan; S/N BA74EU59035; Engine # 701M6015; Cream, Apple Green accent/Black leather; Estimate $101,936 – $152,904; Competition restoration, 3- condition; With Reserve; Hammered Sold at $101,936 plus commission of 15.00%; Final Price $117,226. – RHD. Competition car raced by Alan Mann Racing, driven by Jackie Stewart, Jacky Ickx, Frank Gardner, Lucien Bianchi and more. Twin cam Lotus engine with dual Webers, many replacement body panels, pushbutton radio, heater, full interior, no rollbar. – Stored since at least 1978 after being raced extensively through its early life. Partially restored in the 70’s then stored. The cream paint is in poor condition. Black leather interior is good and presentable with no obvious wear and is complete, including rear seat. A desirable classic for all the events and race series it qualifies for but let down by that poor paint and as a practical matter in need of a full re-restoration and competition preparation. – A pretty special automobile with an important history and potentially excellent performance albeit with a lot of work needed before it can be realized. The eventual owner has a consequential decision to make along the way: restore it as-raced, or add the needed modern safety equipment to take it on track. Either way, it will be an exciting (and expensive) journey but at least at this stage the investment is appropriate to the car and its history. Lot # 121 1959 Mercedes-Benz 190SL Roadster; S/N WDBR1210408500875; Blue-Grey, Blue-Grey hardtop/Blue leather; Estimate $89,194 – $114,678; Older restoration, 3- condition; With Reserve; Hammered Sold at $76,452 plus commission of 15.00%; Final Price $87,920. – RHD. Becker Brescia radio, hardtop only. – Restored in Germany in the early 90’s, stored since. The paint is deteriorating badly and is showing blisters on many areas. Good interior, showing little wear. Orderly but dirty engine compartment and chassis. – This is a challenging project. The paint needs to be redone, followed by decisions about just how far to go, always being tempted by “while it’s apart”. It is possible to budget the project on the basis of this acquisition cost and not go underwater but 190SL values have been softening off their peak of a few years ago and the investment curve may intersect the value curve at some point. Lot # 123 1913 Sunbeam 12/16hp Tourer; S/N 6525; Engine # 7014; Grey/Grey-Blue leather; Beige cloth top; Estimate $63,710 – $70,081; Older restoration, 3+ condition; With Reserve; Hammered Sold at $62,436 plus commission of 15.00%; Final Price $71,801. – RHD. Artillery wheels, tape-wrapped steering wheel, bulb horn, 3-liter F-head four-cylinder, single sidemount spare. – Sound older paint, brightwork and interior. Wood struts on convertible top are worn and need revarnishing as does the coach line detailing on wheels etc. Overall in good condition needing only minor detailing to finish. – Immensely intriguing and entertaining, the result here stands without argument as a sound value for the money. 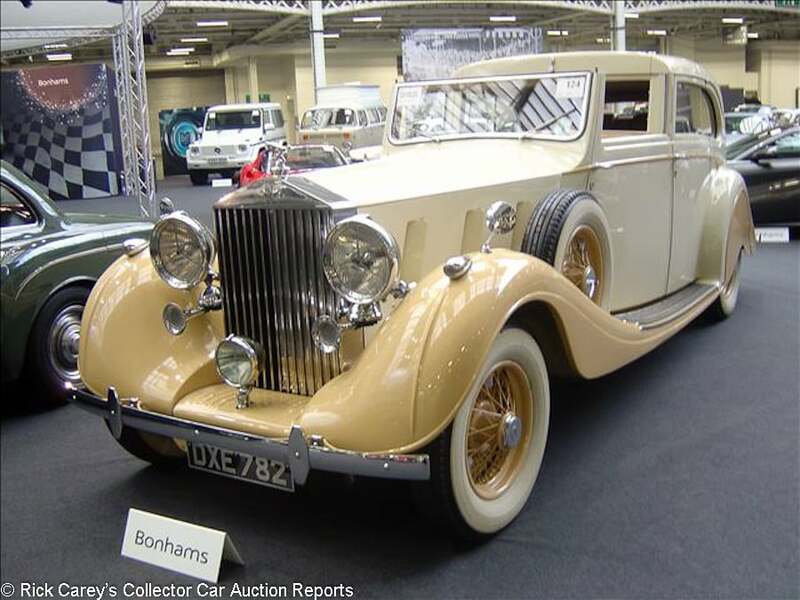 Lot # 124 1935 Rolls-Royce Phantom III Sedanca de Ville, Body by Gurney Nutting; S/N 3AX109; White, Beige fenders/Biscuit leather; Estimate $178,388 – $229,356; Recent restoration, 3+ condition; With Reserve; Hammered Sold at $152,904 plus commission of 15.00%; Final Price $175,840. – RHD. Rollup division, jump seats, RCA Victor radio, Smiths clock, smoker’s kits, Beige wire wheels, wide whitewalls, dual sidemounts, nearly full tool tray, rear wheel spats, dip beam light. – Recent Cream vanilla paint ( ugh! ). With a light biscuit interior also, this is one for the colorblind buyer. Well presented with the interior leather in superb condition and good older paint and chrome. Some interior wood is showing varnish deterioration but is largely very good. – Agreed that this is a fairly awful livery more appropriate for upholding the fading image of an ageing Hollywood leading lady than for a captain of industry or finance. The problem will be with changing the color scheme, an expensive venture not feasible after spending this much for the car. So, live with it. 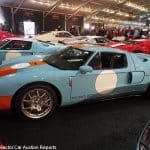 Lot # 125 1991 GTD-Ford GT40 Coupe; S/N 23690; Gulf Blue, Gulf Orange/Slate Blue leather; Estimate $76,452 – $89,194; Cosmetic restoration, 2+ condition; With Reserve; Hammered Sold at $89,194 plus commission of 15.00%; Final Price $102,573. – RHD. 302, Holley 4-barrel, Edelbrock heads, fire system, air conditioning, 4-point belts, AP disc brakes, BRM replica alloy wheels, Avon tires, Kenwood stereo, power locks. – GT40 Recreation with Le Mans style identification. Leather is in great shape. Detailed cosmetic restoration in 2015, drivetrain upgrades, all new fixings and no obvious issues. Prepared to a good standard, said to be 6,235 miles and looks better than new. – Impressively assembled, finished and prepared with both competition and touring equipment, a seriously fast dual-purpose car, even if it isn’t really a Ford GT. 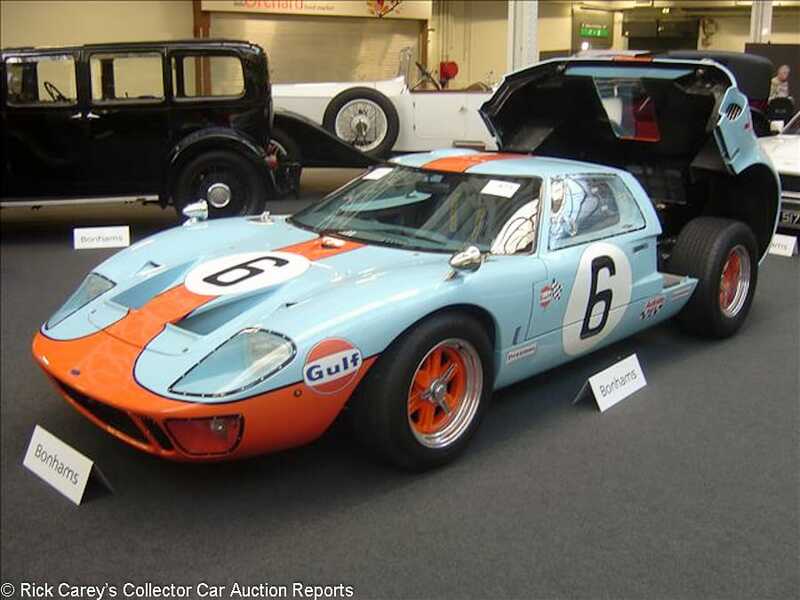 This result is about a third the price of a Heritage Edition 2006 Ford GT, a box full of endorphins for a realistic price at the top of Bonhams pre-sale estimate range. Lot # 126 1957 Jaguar Mark 1 2.4-Litre 4-Dr. Sedan; S/N S907056; Mist Grey/Red leather; Estimate $30,581 – $36,952; Older restoration, 3+ condition; With Reserve; Hammered Sold at $25,166 plus commission of 15.00%; Final Price $28,941. – RHD. Fog lights, 4-speed, steel wheels, hubcaps, blackwall tires, aluminum radiator, new exhaust and shocks, BMIHT certificate. – Off the road for nearly 50 years, recently recommissioned but lacking detail of parts replaced. Seats have been redyed but done well. A popular car in the UK featured in TV series but steel wheels and a dull colour don’t attract attention. 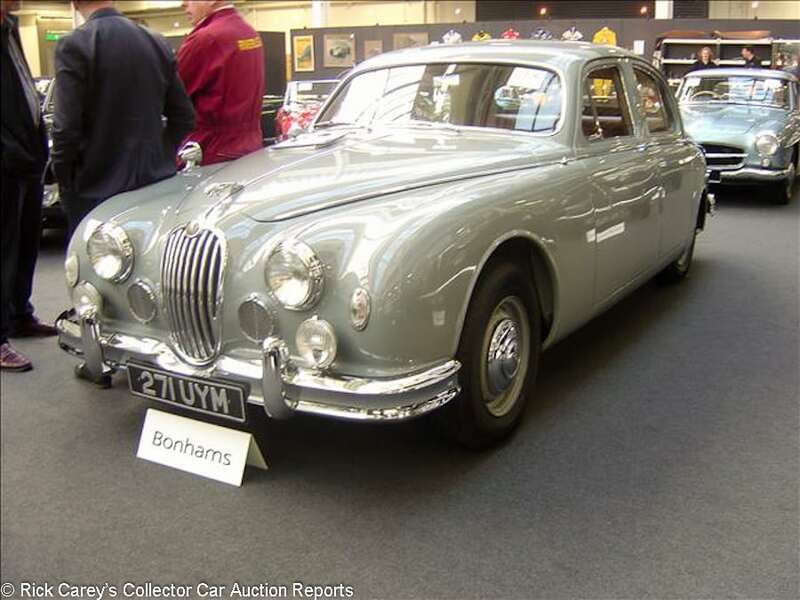 – Jaguar’s first mid-size saloon car with an XK-based short stroke 2,483cc engine and a single downdraft carburetor giving about 112hp and unit body construction. It wasn’t a commercial success until it graduated to the full XK 3.4 and ultimately 3.8 liter engines in the Mk 2. The 2.4’s mediocre performance is a drawback, but its relative rarity helps its value which in this case should have been enough to buy a comparable 3.4 with much superior performance. Lot # 127 1961 Bentley S2 Continental Coupe, Body by H.J. Mulliner; S/N BC15CZ; Tudor Grey/Crimson leather; Estimate $293,066 – $331,292; Recent restoration, 3+ condition; With Reserve; Not sold at Hammer bid of $248,469. – RHD. Automatic, sunroof, power windows, power antenna, Marchal horn, later air conditioning, hubcaps, trim rings, blackwall tires, fog lights, pushbutton radio – Recent paint and exterior chrome. Seat leather has been redyed. Engine rebuilt in 2015. A good restoration, but with small details needing attention. Desirable registration “SXW 1”. – A notchback-style Mulliner S2 Continental like this isn’t as desirable as the fastback, but has the same level of performance and luxury. At about half the cost it is a great value for money. This one was on the block here a year ago where it sold for $240,606 (GBP 180,000 at the time) and sold at the Goodwood Revival three months ago for $279,633 (GBP 216,200 at the time.) This result is GBP 195,000 and no surprise it didn’t sell. 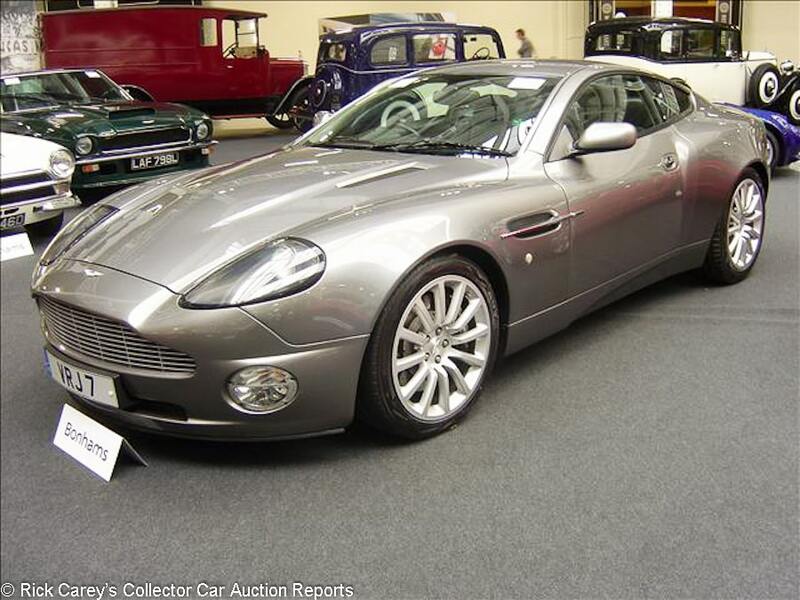 Lot # 128 2001 Aston Martin V12 Vanquish Coupe; S/N SCFAC13351B500007; Skye Silver/Chestnut leather; Estimate $82,823 – $95,565; Unrestored original, 2- condition; With Reserve; Not sold at Hammer bid of $76,452. – RHD. 6-liter/460hp V12, 6-speed Automanual, Power Park mirrors, heated front seats, aluminum/leather steering wheel, heated windshield, power windows, air conditioning, satellite navigation, cell phone integration, fire extinguisher – An ex press car. original Registration mark. First owned by Aston Chief Executive Dr. Ulrich Bez. Appears all original and in good condition but a 17 year old car needs regular use to keep all those rubber seals supple and unseen metal rust free. A good appreciating classic buy. – Or it would have been a good buy, if it had sold. With just GBP 5,000 between the reported high bid and the low estimate it would have been reasonable to take the offer and let it go if there was money at this bid. Lot # 129 1958 Aston Martin DB MkIII Coupe, Body by Tickford; S/N AM30031612; Dark Blue/Grey leather; Estimate $127,420 – $178,388; Unrestored original, 3- condition; With Reserve; Hammered Sold at $124,872 plus commission of 15.00%; Final Price $143,602. – RHD. Silver painted wire wheels, blackwall tires. – Dark blue paint is badly presented, not satisfactory at all. Grey leather interior is worn and a disappointment. The engine appears to have been out and rebuilt but then put back in the superficially repainted engine compartment. One of only 55 made. Described as candidate for sympathetic restoration but UK restoration costs will not come cheap for a Aston. 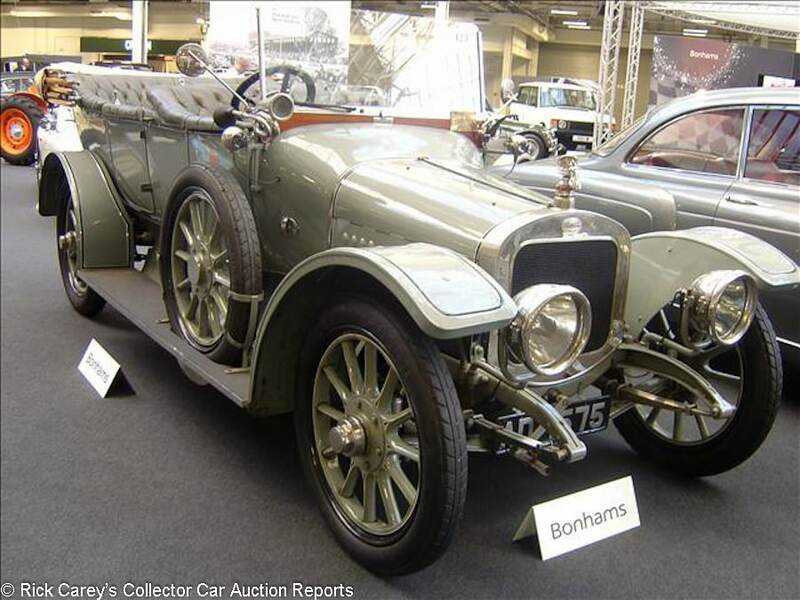 – The rather daunting costs of refurb and restore seem to have been taken into account by both Bonhams in the pre-sale estimate and by the bidders in arriving at this result, one that is fair to both sides of the transaction. Lot # 130 1953 Healey Abbott Drophead Coupe, Body by Abbott; S/N F3068; Engine # F8201; Red/Beige leather; Estimate $57,339 – $70,081; Cosmetic restoration, 2- condition; With Reserve; Not sold at Hammer bid of $48,420. – RHD. Trafficators, Lucas driving lights, fender mirrors. – Fresh restoration but paint poor on the scuttle top. Interior is new and perfect. The engine compartment is neat, but not fully restored and is showing age. One of 77 made. Nice proportions but not a looker. The 2,443cc Riley engine is good and strong with twin SUs. An enjoyable driveaway four seat tourer. – Must be worth more in the UK than the U.S. because the reported high bid in US$ is more than adequate for this Healey’s equipment and condition. 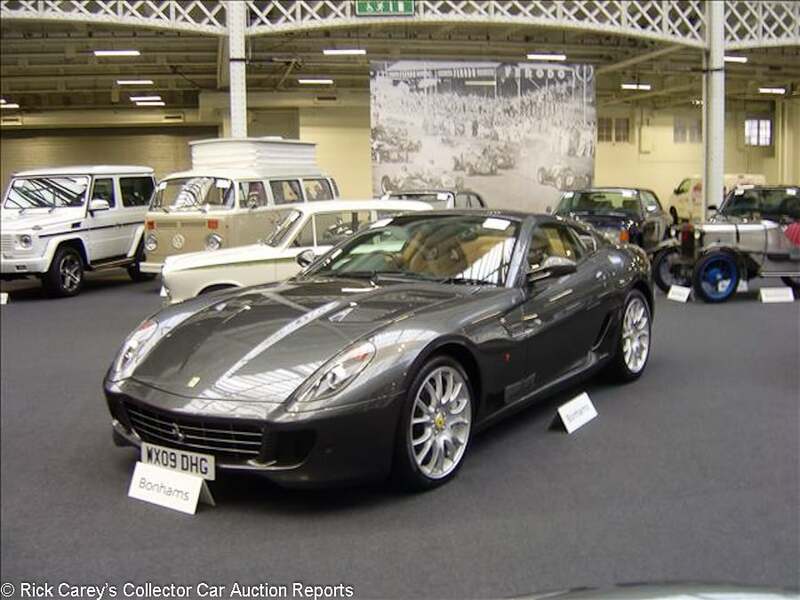 Lot # 131 2009 Ferrari 599 GTB Fiorano Coupe; S/N ZFFFD60C000168149; Grigio Silverstone/Light Biscuit leather; Estimate $140,162 – $165,646; Unrestored original, 3- condition; With Reserve; Not sold at Hammer bid of $114,678. – RHD. Paddle shift, 20 inch wheels, titanium painted brake calipers, electric seats, carbon fiber Daytona seats, parking sensors, sports exhaust, carbon fiber steering wheel. – Lots of paint chips on the nose area, clearly evidence of use supporting the 24,000 miles claimed from new. Full dealer service history. – The 599 GTO is currently a depreciating asset which the bidders here sought to anticipate with the reported high bid. The consignor is taking the other side of the bet in the fond hope of finding a more willing audience. Lot # 132 1937 Bentley 4 1/4 Liter All-Weather Tourer, Body by Vanden Plas; S/N B179JY; Green/Dark Green leather; Black cloth top; Estimate $152,904 – $191,130; Competition restoration, 2 condition; With Reserve; Hammered Sold at $152,904 plus commission of 15.00%; Final Price $175,840. – RHD. Body color wheel discs, single sidemount, dip beam light, overdrive added – Finish to a high standard in every department. Tyres look recent, leather is to a taut high standard. A restoration commensurate to the quality of the car. Rare “wide body” with 4″ more lateral room than standard. 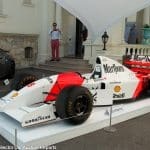 Once converted to an estate rear body, now returned to original design by specialists during its mid-90’s restoration for Benetton F1 technician Robin Grant. 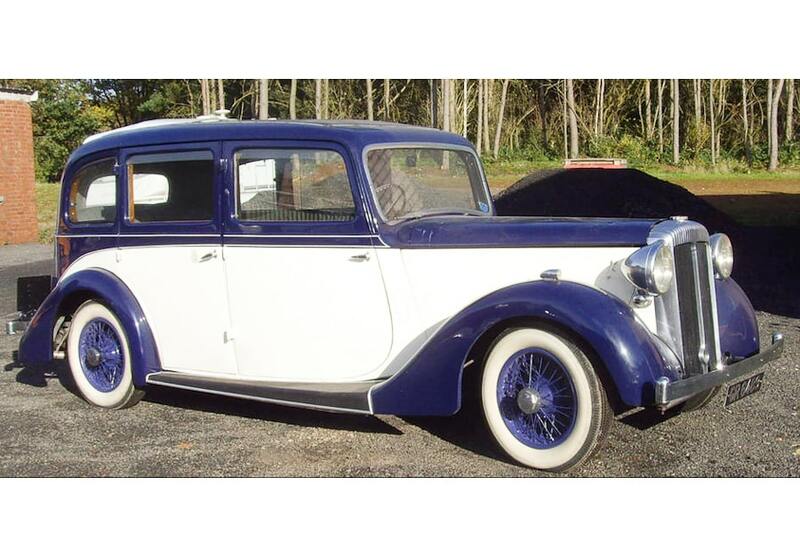 – This is an intriguing and practical old car with practical all-weather coachwork with windup windows. It is done to unusually high standards and now effectively two decade old restoration is showing its quality by the way it is holding up. All those attributes were recognized by the bidders here with this realistic result. 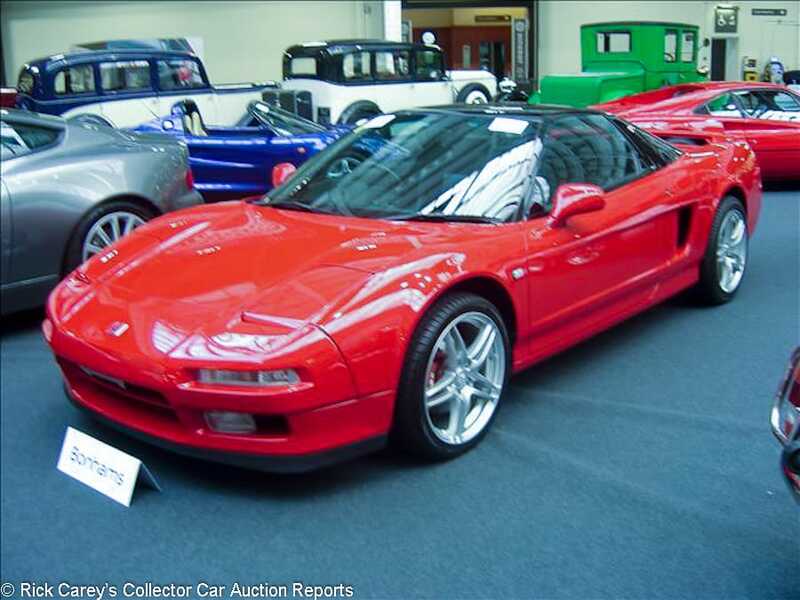 Lot # 134 1991 Honda NSX Coupe; S/N NA11001859; Red, Black roof /; Estimate $48,420 – $61,162; Unrestored original, 3+ condition; With Reserve; Not sold at Hammer bid of $38,226. – RHD. 3 liter/270hp, automatic, popup lights, aftermarket wheels, red calipers, Pioneer Carrozzeria stereo. – Look like a good original car externally but purple colored aftermarket tailpipes indicate a boyish owner with poor taste. Japanese import. Automatic reduces desirability in the UK. – Even in the UK market where the righthand steering is desirable the automatic and Japanese instrument and switch legends handicap the car and make the reported high bid for it reasonable. 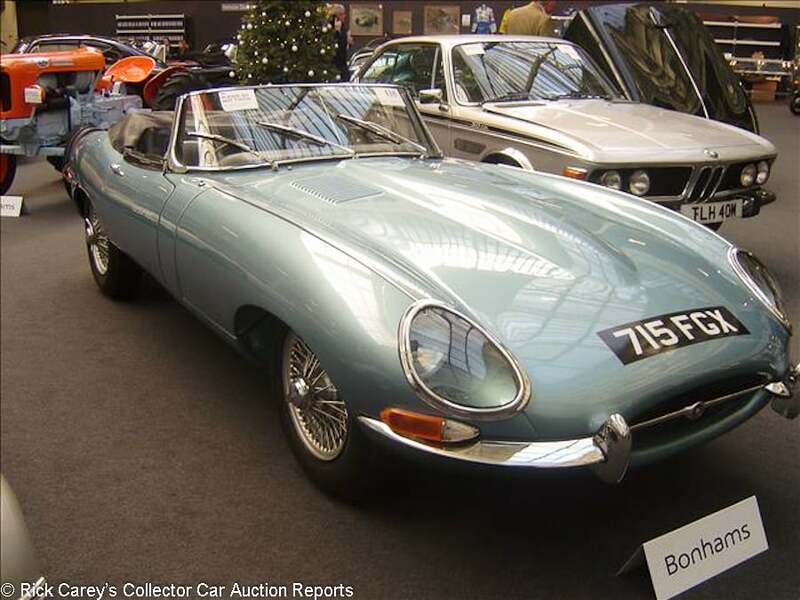 Lot # 135 1961 Jaguar XKE SI flat floor Roadster; S/N 850164; Light Metallic Blue/Black leather; Black cloth top; Estimate $165,646 – $203,872; Recent restoration, 2- condition; No Reserve; Hammered Sold at $82,066 plus commission of 15.00%; Final Price $94,376. – RR. Silver painted wire wheels, Motorola pushbutton radio, aluminum radiator, electronic ignition. – Extensively restored over the last four years but the interior is shabby and needs finishing. Engine well presented. Same owner since 1985. A good early E-Type Jaguar. The only car Enzo envied! 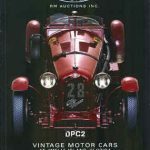 – This is far and away the bargain of the auction, and a No Reserve car that concluded with a post-block deal (unless GBP 64,406 is a rational high bid amount.) It’s thoroughly done, even if the upholstery leaves much to be desired, and could have brought the low pre-sale estimate without being expensive. This is a deal. Lot # 137 1987 Mini Margrave 1,275cc 2-Dr. Sedan, Body by Wood & Pickett; S/N SAXXL2S1020338771; Metallic Mauve, White vinyl roof/Beige leather; Estimate $25,484 – $38,226; Competition restoration, 3 condition; No Reserve; Hammered Sold at $15,036 plus commission of 15.00%; Final Price $17,291. – RHD. Automatic, Minilite wheels, leather interior, sports exhaust, badge bar, grille guard, fog lights, wood dashboard, power windows, Moto-Lita woodrim steering wheel, CD stereo. – Rare Automatic Mini with Margrave luxury outfit from Wood & Pickett including a bizarre white vinyl roof with small rectangular quarter windows. Good leather. Badge bar needs removing to tidy it up. Bit of an oddball for the specialist buyer. Never sold or registered until 2013, now with 4,000 miles. 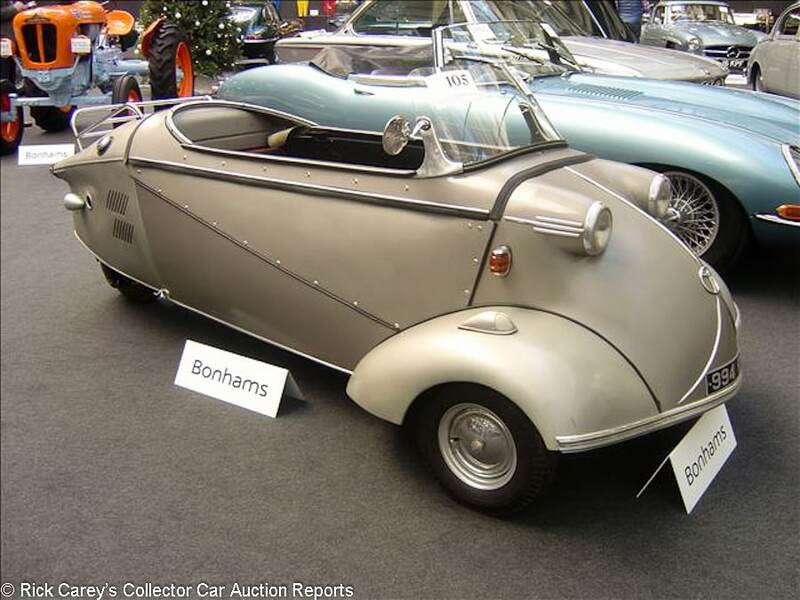 – Most people would be embarrassed to be seen behind the wheel of this contraption so the seller is fortunate that Bonhams found someone willing to pay this much for it. 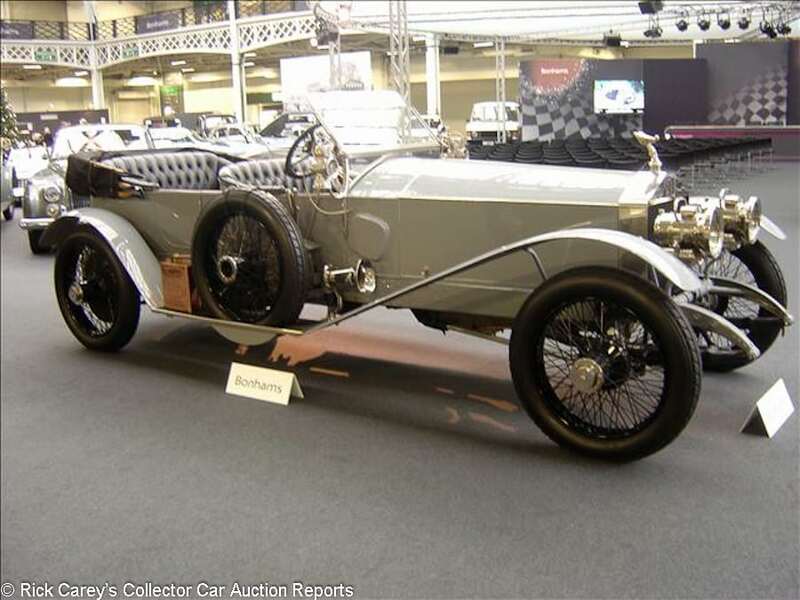 Lot # 138 1921 Rolls-Royce Silver Ghost 40/50hp London-to-Edinburgh Tourer, Body by Alpine Eagle; S/N 48CE; Grey/Black leather; Black cloth top; Estimate $382,260 – $509,680; Rebodied or re-created, 2 condition; With Reserve; Hammered Sold at $305,808 plus commission of 15.00%; Final Price $351,679. – RHD. Double Elliott speedometer/odometer, nickel brightwork, black wire wheels. – Originally a Locke Town Coupe for Mrs. W.K. Vanderbilt (Anne Harriman.) Eventually found in 1957 being used as a pickup on an Illinois farm and restored with this London-to-Edinburgh replica coachwork. New engine block and rebuild December 2017. Grey coach paint done to a high standard. Black leather showing no wear or marks. All the important brightwork lamps, exterior speedometer look in the correct period condition. Exactly how an important car should be preserved and presented, clearly had great recent ownership for such an important carriage. – It didn’t begin life as a L-E Tourer, but carried Willie K and missus around New York, Newport and Palm Beach in stylish and comfortable luxury. The current body is done to exacting standards, and is a big improvement on its prior pickup truck incarnation. Finally, the price is moderate for its combination of style, performance and presentation. 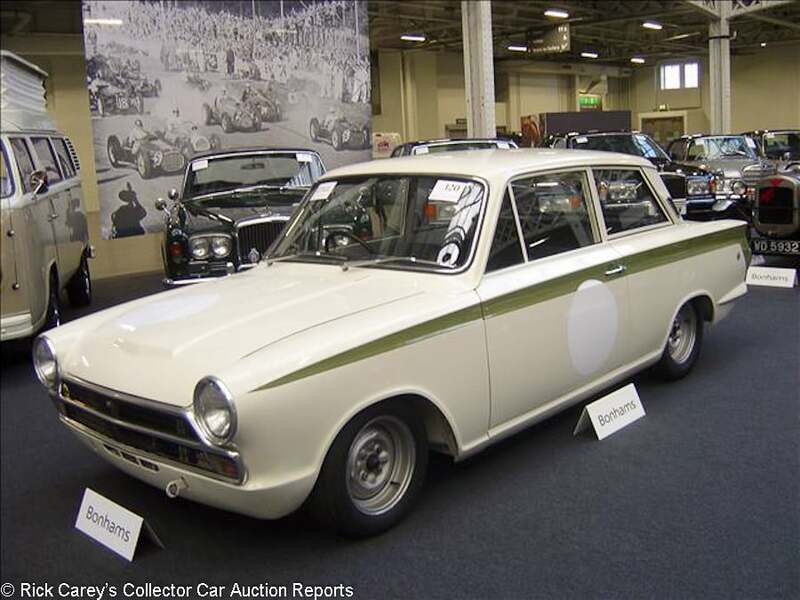 Lot # 140 1966 Ford Lotus Cortina Mk1 2-Dr. Sedan; S/N BA744362065; Ermine White, Green accent/Black vinyl; Estimate $50,968 – $63,710; Older restoration, 3 condition; With Reserve; Hammered Sold at $48,420 plus commission of 15.00%; Final Price $55,683. – RHD. Stock wheels, hubcaps, blackwall tires, roof-mounted radio antenna, woodrim steering wheel, console, blue painted cam covers. – Older restoration done in 1977 using an original factory body shell. Featured in Classic Ford mag so a known UK car with lots of history. Appears useable and has a well presented engine bay. – This is a lot less expensive than the other Lotus Cortina in today’s Olympia auction, but this one has never had Jackie Stewart behind the wheel in competition. The result is sensible for a sensitively older restored Lotus Cortina. 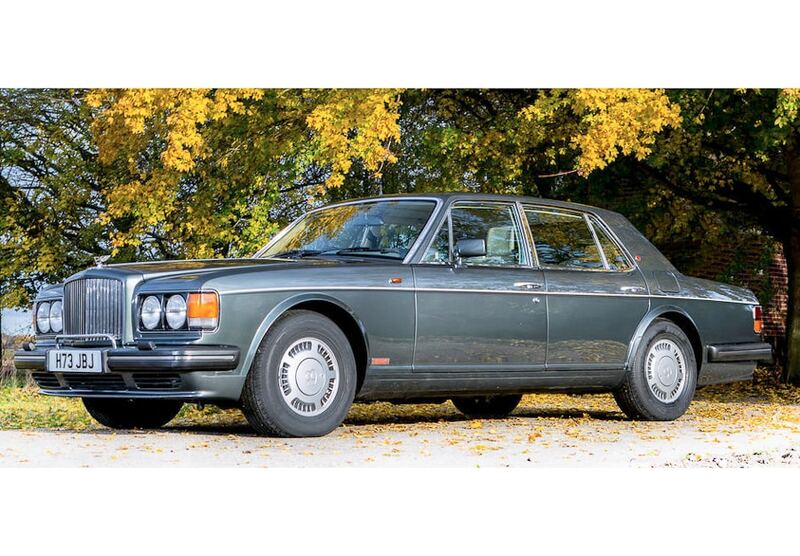 Lot # 141 1998 Rolls-Royce Silver Seraph 4-Dr. Sedan; S/N SCALA61E4XCH02042; Black/Grey leather; Estimate $25,484 – $38,226; Unrestored original, 3+ condition; With Reserve; Hammered Sold at $24,210 plus commission of 15.00%; Final Price $27,841. – RHD. Loaded with options and accessories. – Owned by Sir Alan Sugar, Amstrad. 80k miles from new. Black over grey leather all in very good original condition. Full Service History. A good value limousine. – This is not much money for an automobile of such prestige, performance and luxury, an opinion that will change the first time it goes to a specialist’s shop for anything more significant than an oil change. 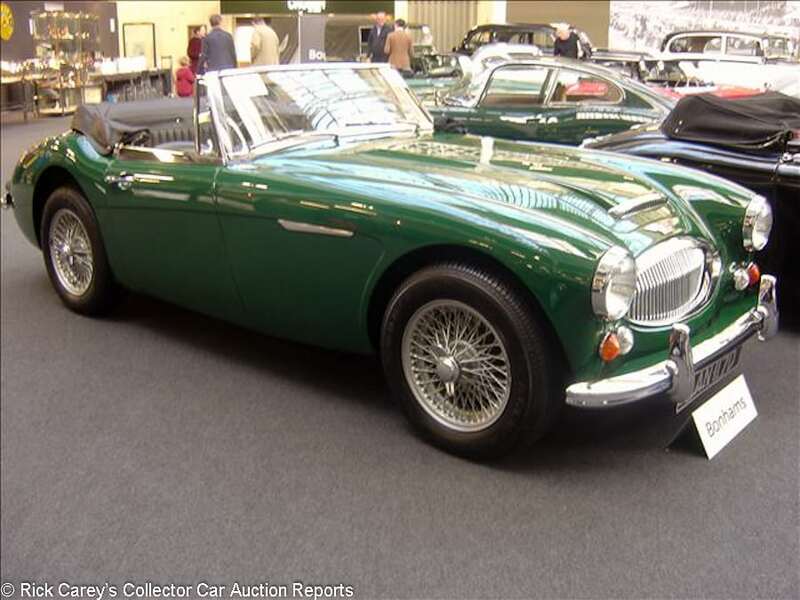 Lot # 142 1966 Austin Healey 3000 Mk III Phase 2 Convertible; S/N HBJ834338; Green/Black leather; Black leatherette top; Estimate $91,742 – $104,484; Older restoration, 2- condition; With Reserve; Not sold at Hammer bid of $82,823. – RHD. Overdrive, silver painted wire wheels, heater, leather rim Moto-Lita steering wheel. – Full restoration, very well presented, new interior showing minimal wear or age. Orderly and clean engine compartment. An original RHD 3000 Mk III Phase 2, not a conversion. 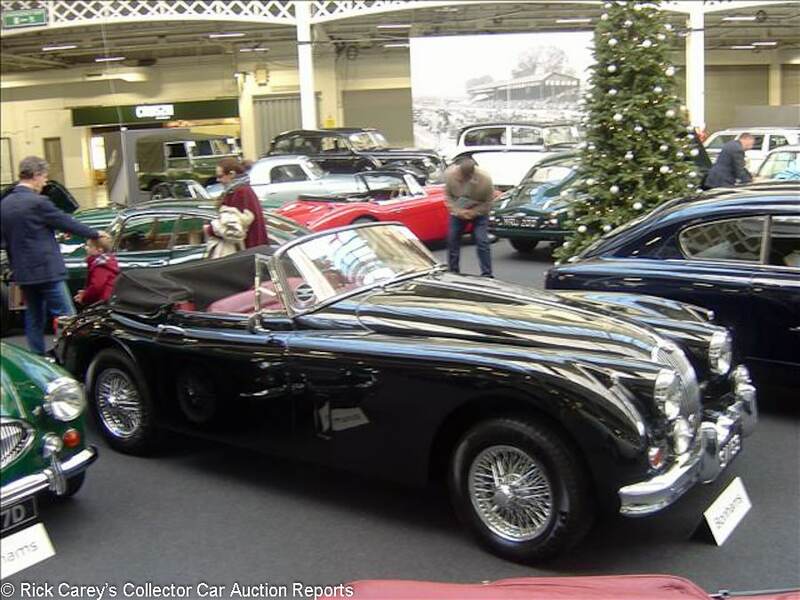 – It is likely that the righthand drive has great appeal in the UK, because the reported high bid would have been sufficient to see this Healey off to a new home in the U.S. Lot # 143 1933 MG Midget J1 Special Sports; S/N 0490BK; Black/Red leather; Estimate $25,484 – $38,226; Older restoration, 3+ condition; With Reserve; Not sold at Hammer bid of $23,190. – RHD. Hydraulic front brakes, folding windshield, dual aeroscreens, fog lights, cycle fenders, banjo spoke steering wheel, silver painted wire wheels, single rear spare. – Older restoration but the interior looks fresh. Red painted drum brakes look incorrect but otherwise a very smart car. Represented as being the original engine, rebuilt in 1996. 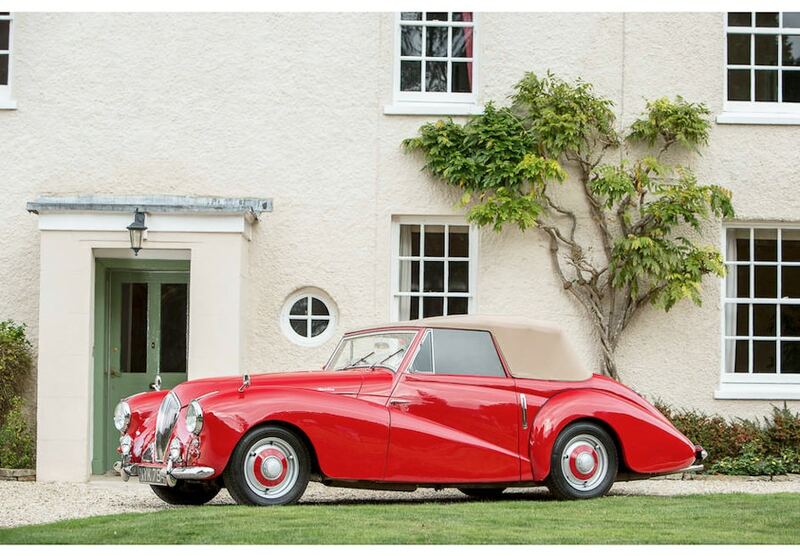 – Sold by Bonhams at Oxford in 2014 for $46,644 (GBP 29,900 at the time, the present bid is just GBP 18,200.) The estimate range indicates the consignor was prepared to take a beating, but not this much of a beating. Lot # 144 1922 Austin 20hp Tourer; S/N PCH597; Burgundy, Black fenders/Grey leather; Black cloth top; Estimate $22,936 – $25,484; Competition restoration, 3 condition; With Reserve; Hammered Sold at $15,290 plus commission of 15.00%; Final Price $17,584. – RHD. Wind wings, black wire wheels, overdrive added. – Originally built as a landaulette but reworked to tourer after service as a lorry in the late 30’s, has had three owners. Stored for 29 years and rebuilt in 2011. Average finish, exterior not rechromed. Engine bay presentable, a pleasant lightweight weekend driver. – Modest but practical, enjoyable and in good enough condition that it gives the new owner just enough in the way of project to make for an enjoyable winter. It’s hard to go wrong at this price. Lot # 145 1939 Bentley 4 1/4 Liter Tourer, Body by Crailville to a Vanden Plas design; S/N B7MX; Engine # K9BE; Red, Black/Grey leather; Black cloth top; Estimate $152,904 – $191,130; Rebodied or re-created, 3+ condition; With Reserve; Hammered Sold at $180,936 plus commission of 15.00%; Final Price $208,077. – RHD. Black wire wheels, dip beam light, rear-mounted spare, factory overdrive. – Represented as the original engine, originally a 4-Dr. Sedan by Park Ward. This 2-Dr. Tourer in the style of Vanden Plas was built during restoration completed in the late 90’s after two decades in process; the original body comes with the car. Fresh paint and most exterior chrome new and replated. Carpets are poor and let the car presentation down. Seat leather is stretched and shows use consistent with the continental touring history since restoration. Generally a good car with minor distractions. 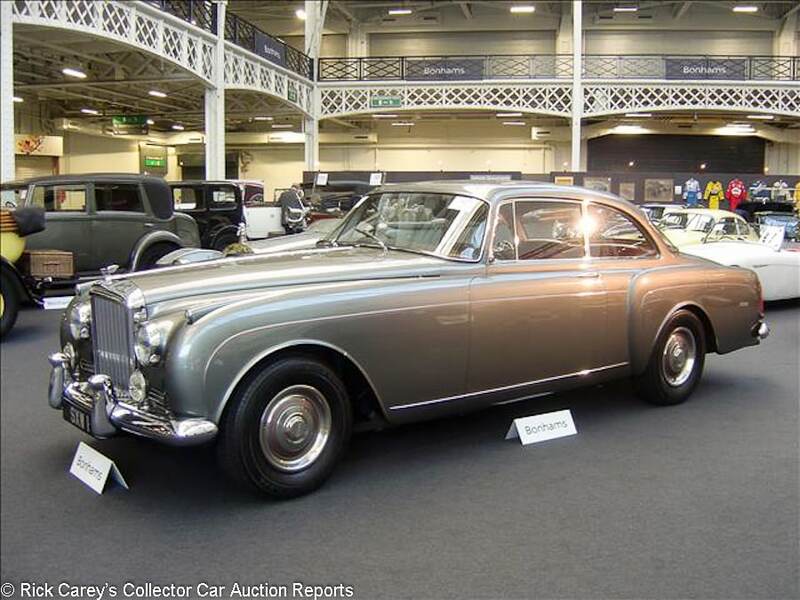 – The bidders clearly were drawn to this Bentley, as well they should have. It’s done to high standards and two decades after the restoration, with substantial subsequent miles, it is holding up extremely well. Even well into Bonhams pre-sale estimate range it is still an exceptional Bentley for a realistic price. Lot # 146 1960 Jaguar XK 150 3.8-Litre Drophead Coupe; S/N S838988; Black/Red leather; Black cloth top; Estimate $71,355 – $79,000; Older restoration, 3- condition; With Reserve; Not sold at Hammer bid of $61,162. – RHD conversion. Chrome wire wheels, alternator, upgraded front brakes, oil filter, oil cooler, electric fan, 5-speed gearbox. – Black paint is dry and cracked in places. A used Jaguar with no obvious mechanical woes but the poor paint makes you wonder about all the eye can’t see. Would have fared better if the owner had prepared better. – This Jag, with all its faults and shortcomings, would not have been expensive at the low estimate. The deviations from standard equipment are neither here nor there from the point of view of value in this case which is a straightforward weekend driver. 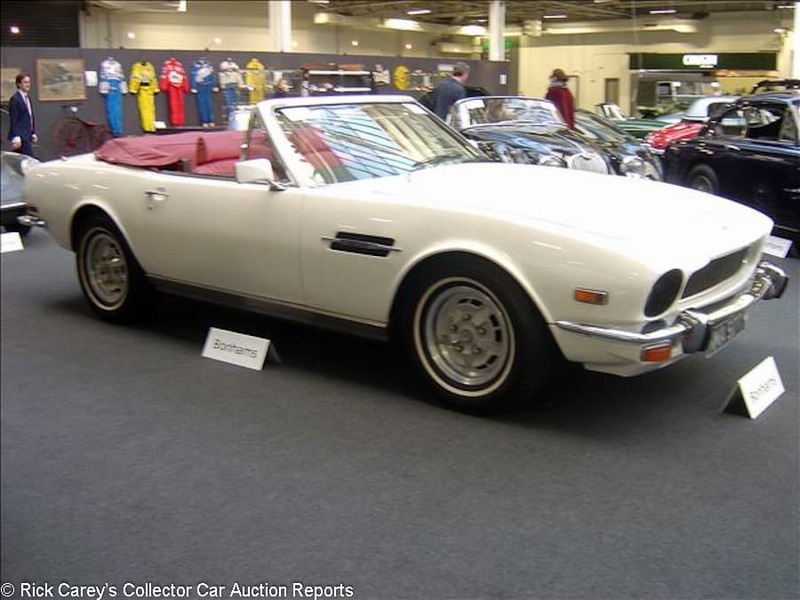 Lot # 147 1979 Aston Martin V8 Volante; S/N V8COL15036LFA; White/Burgundy leather; Burgundy leatherette top; Estimate $82,823 – $108,307; Older restoration, 3- condition; With Reserve; Hammered Sold at $58,447 plus commission of 15.00%; Final Price $67,214. – Lefthand drive. Automatic, alloy wheels, upgraded brakes and cooling, woodrim steering wheel, air conditioning, Blaupunkt Berlin cassette stereo (the one with the tuning controls on a flexible stalk) power windows. – Presented in a dullish white with faded red leather interior, not a safe choice combination. Shabby wheels, not corroded, just dull. LHD and automatic will keep the market price low for this model. – And that’s what it brought in an economical post-block concluded transaction. A used car of no particular distinction but important to note that it’s worth more than this in North America. Lot # 148 1973 Ferrari 246 GTS Dino Spider, Body by Pininfarina-Scaglietti; S/N 07176; Rosso Corsa/Black vinyl; Estimate $445,970 – $573,390; Recent restoration, 2+ condition; With Reserve; Not sold at Hammer bid of $382,260. – RHD. Full tool roll, Cromodora alloy wheels, Michelin XWX tires, power windows – Represented as single family owned from new. Fresh restoration to a high standard, no overspray and superb preparation. Interior, wheels and tyres all A1. Clean, orderly, fresh engine compartment. 51,227 miles on the odometer and looks genuine. In the top three for this auction. – Something of a challenge. The single family ownership and quality restoration as well as its original righthand delivery specification make this something of a special car. Is that enough to make it worth any more than this result, which in North America would be an appropriate, if not slightly generous, price for a 246 GTS without air conditioning? It seems like the seller could have taken this bid with only a little disappointment. It will be hard to find a venue or situation where it’ll bring more. 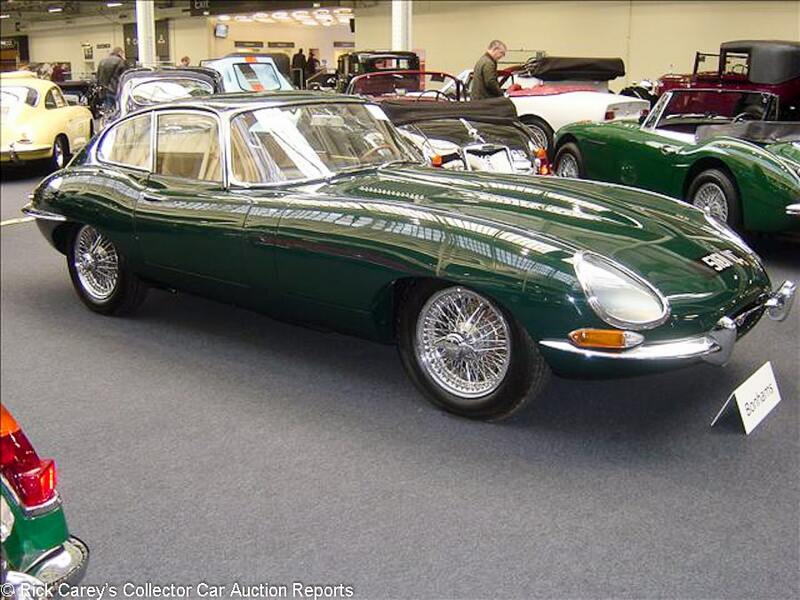 Lot # 149 1962 Jaguar XKE SI Fixed Head Coupe; S/N 886967; BR Green/Biscuit leather; Estimate $114,678 – $140,162; Recent restoration, 2+ condition; With Reserve; Hammered Sold at $108,307 plus commission of 15.00%; Final Price $124,553. – Lefthand drive. Upgraded 4-piston front brakes, high back seats, cooling fan and console, chrome wire wheels, including the spare with hammer and jack. – Recent paintwork to a very high standard. Some new exterior chrome and original trim also. What appears to a completely original Biscuit interior which is in perfect, flawless classic condition. Show polished engine and clean, tidy engine compartment. 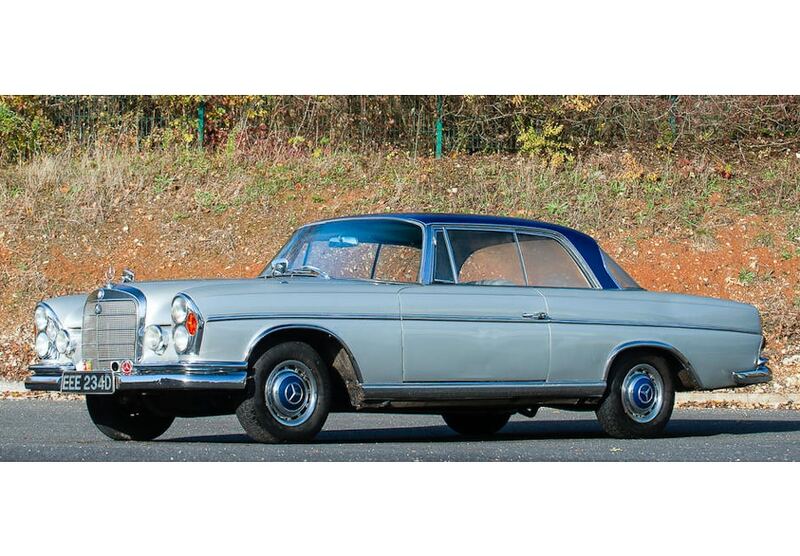 I would buy this car, it really is the stand out modern classic of this auction, the best one. – This is a fairly impressive result for a lefthand drive E-Type in a UK auction, even one so attractively restored and presented. It is worth no more than this in North America. Lot # 150 2003 Aston Martin V12 Vanquish 2 + 2; S/N SCFAC133633500990; Grigio Titanio/Black leather; Estimate $82,823 – $95,565; Unrestored original, 2 condition; With Reserve; Not sold at Hammer bid of $55,852. – RHD. Paddle shift, heated power seats, Linn CD/cassette stereo, 19-inch wheels, air conditioning, rain-sensing wipers, trip computer and more. 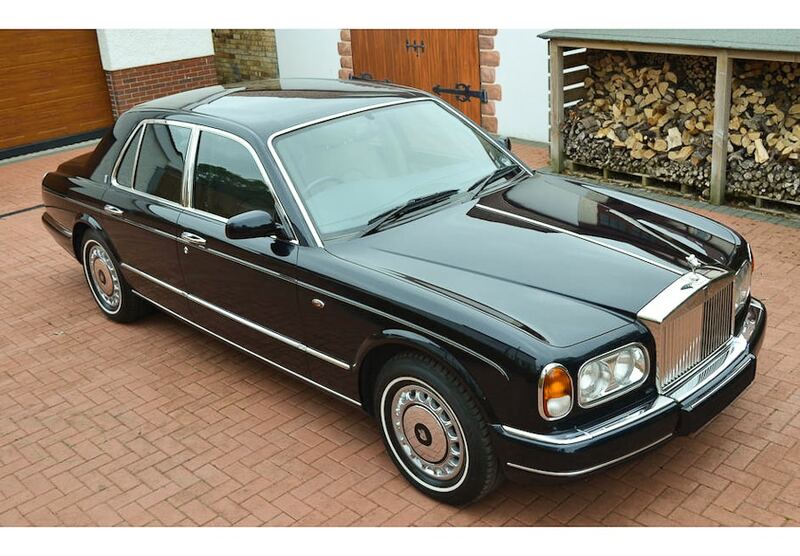 – Original and simply superb condition represented a 34,568 miles from new. 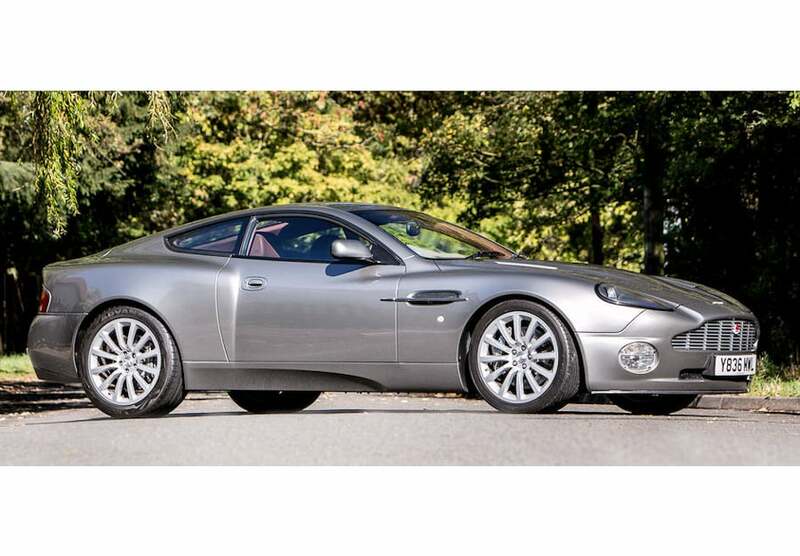 Featured in recent Bond films this Vanquish is another star quality car. No signs of wear, very well prepared and presented and essentially like new. – Reported sold on Bonhams website at an undisclosed price, this result is from Hammerprice in a post-block transaction, a whopping great deal in an exclusive Aston Martin with breathtaking performance and luxury. Lot # 151 1913 Lancia Theta Tipo A Coupe with Dickey, Body by Morgan & Co.; S/N A1810; Engine # 1810; Green/Tan leather; Estimate $50,968 – $76,452; Older restoration, 3 condition; With Reserve; Hammered Sold at $57,339 plus commission of 15.00%; Final Price $65,940. – RHD. 4,940cc/70hp (35hp rating) inline four, short wheelbase Tipo A chassis, varnished wood spoke wheels, brass brightwork, Rushmore electric starter, electric windshield wiper, single sidemount spare, pullup side windows, Deuta-Werke speedometer. – Intriguing history with Arthur and Marcia Jeddere-Fisher including being raced by Marcia in the 50’s. Bonhams calls this a Coupe, but Coach might be more appropriate and it was once a tow truck. An older restoration, average use with sound but aged paint, dull brass, aged, stretched upholstery and original door panels. A very good, honest, car in all aspects. – An Italian car with a dickey rear seat is certainly a specialist vehicle but it sold well and a 70hp, 75mph example is rare indeed in 1913. Filled with the original features of Vincenzo Lancia’s fertile mind and meticulous engineering, this is a technician’s fascination. Its mid-estimate price is recognition that the Olympia buyers were aware of its many attributes. Chris Sharpe would have the SI Jag FHC; I’d have this Lancia at less than half the price. Lot # 152 2003 Porsche 911 Carrera 4S Coupe; S/N WP0ZZZ99Z35605477; Arctic Silver/Black leather; Estimate $31,855 – $44,597; Unrestored original, 3+ condition; With Reserve; Not sold at Hammer bid of $24,210. – RHD. Heated memory seats, rear wiper, tinted windshield, Bose stereo, sports exhaust, Turbo-look wheels, 6-speed, air conditioning, power steering, Xenon lighting/ – Original condition car with small signs to tell this, like the fuel filler cap is a slightly different colour, which looks original. 55,384 miles from new and looks like it. – A good example but just did not attract the bids and probably not a good placement for a Carrera 4S. 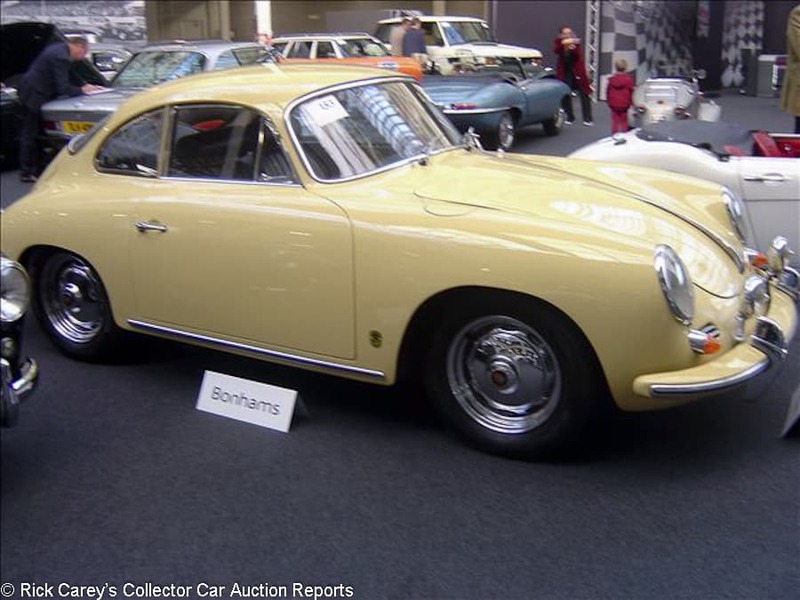 Lot # 153 1961 Porsche 356B 1600 Coupe; S/N 118029; Engine # P607144; Champagne Yellow/Black leather; Estimate $82,823 – $95,565; Older restoration, 3+ condition; With Reserve; Hammered Sold at $89,194 plus commission of 15.00%; Final Price $102,573. – Lefthand drive. Chrome wheels, headrest seats, deluxe horn ring, luggage straps, Blaupunkt multi-band radio. – Good used condition, no obvious repairs, restored in the States in 2010. Would look better in California rather than in grey London. 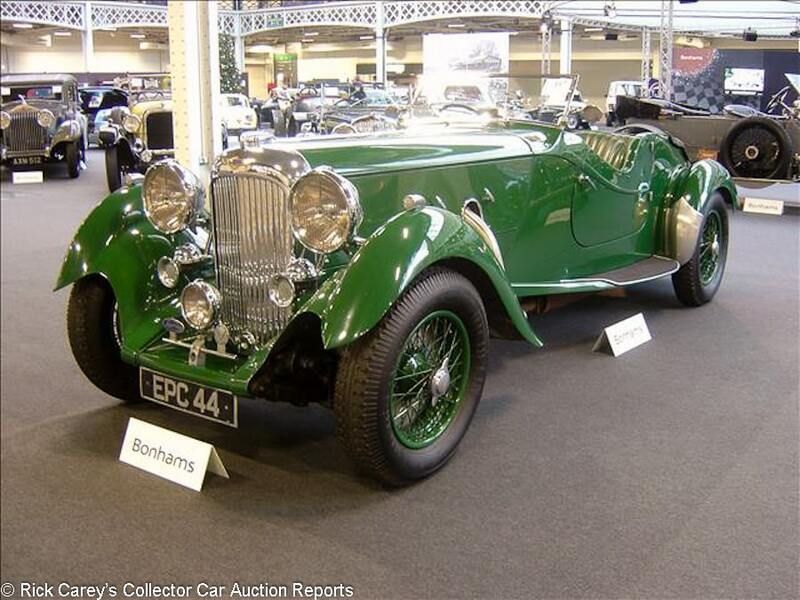 – Reported sold by Bonhams here in London two years ago for $93,648 (GBP 74,300 at the time, this result is GBP 80,500.) 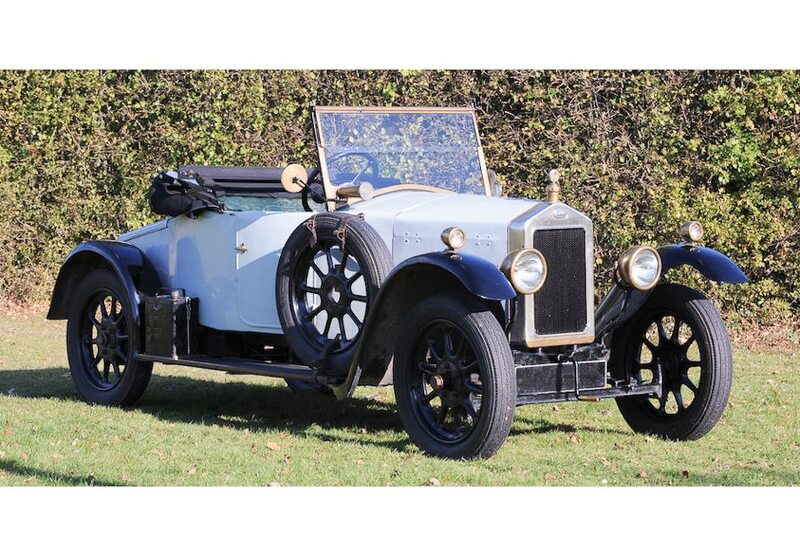 This is a sound and usable car for which an exceptional price was paid for its lefthand drive 1600 standard configuration in this UK auction. By any reasonable standard it is worth less today than it was two years ago. 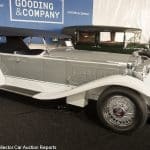 Lot # 154 1922 Rolls-Royce 40/50hp Silver Ghost Tourer, Body by Wilkinson; S/N 28HG; White, Black fenders/Black leather; Black cloth top; Estimate $152,904 – $191,130; Rebodied or re-created, 2- condition; With Reserve; Hammered Sold at $140,162 plus commission of 15.00%; Final Price $161,186. – RHD. White painted wire wheels, dual sidemounts, bulb horn, bell headlights, jump seats, nickel brightwork, Waltham clock, electric started, voice tube intercom. 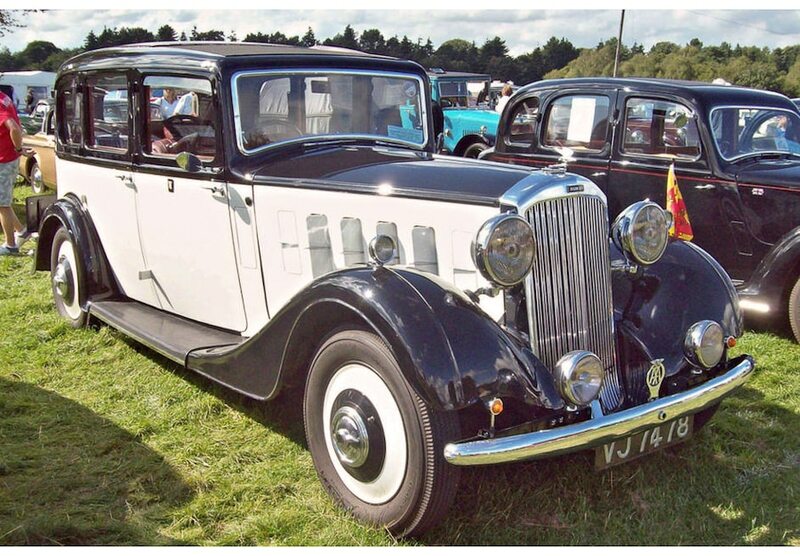 – Originally a Hooper Saloon, later tourer coachwork by Wilkinson. Black leather seats aged but not damaged. Painted wire wheels. Engine rebuilt in 2017. 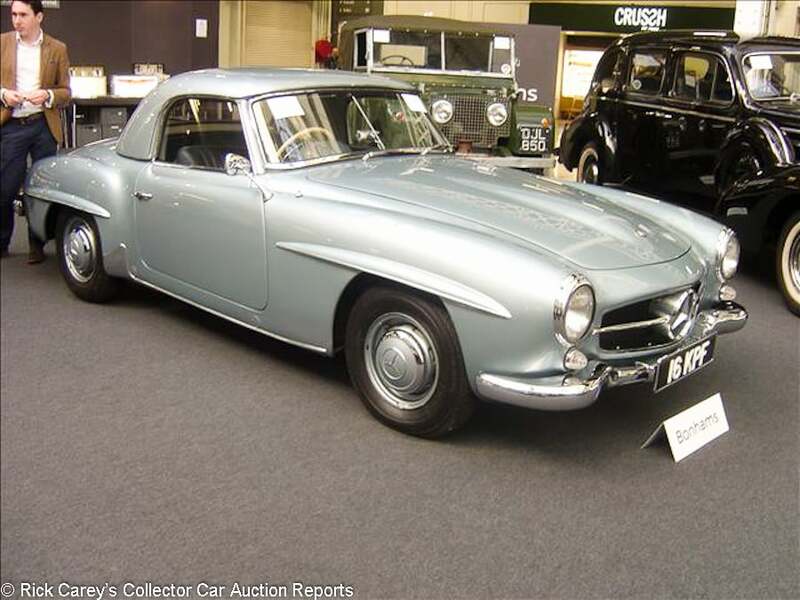 – Reported sold by Coys at Olympia in 2002 for $73,598 (GBP 47,859 at the time, this result is GBP 126,500.) A great car, strong bidding and only just beginning to gain the value they deserve. “You could easily see these Ghosts quadruple in price for the history and quality of the build”, says the English Correspondent. 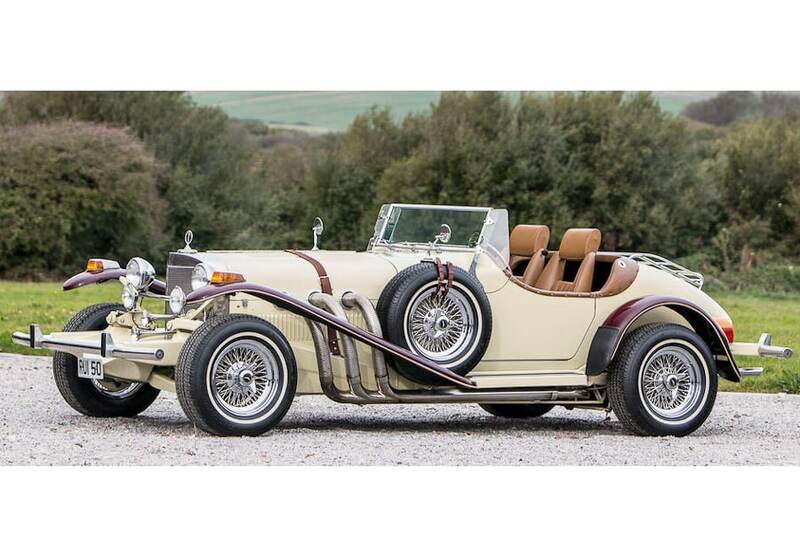 Their challenge is that they’ve always been valued and appreciated and have survived, particularly with replica open coachwork like this, in generous quantities even after being resurrected from stationary pump engines and tractors on British farms. This is a solid value that will be welcome at RREC events, but isn’t the nearly sublime L-E Tourer replica sold earlier today for $351,000. Lot # 155 1989 Porsche 911 Carrera Super Sport Cabriolet; S/N WP0ZZZ91ZKS150914; Silver/Black leather; Blue leatherette top; Estimate $76,452 – $114,678; Older restoration, 2 condition; With Reserve; Hammered Sold at $86,646 plus commission of 15.00%; Final Price $99,642. – RHD. Recoil bumpers, Blaupunkt Toronto cassette, power sport seats, power top, Fuchs wheels, whale tail – An in-vogue car in great original condition with 24,430 miles from new. The whale tail is now considered sublime against all the Eurobox nonentities. – Chris Sharpe likes these (“Watch these go!”), but with 231 naturally aspirated horsepower their performance doesn’t match their Turbo-look styling and will be blown into the weeds by a Corvette at 1/4 the price. 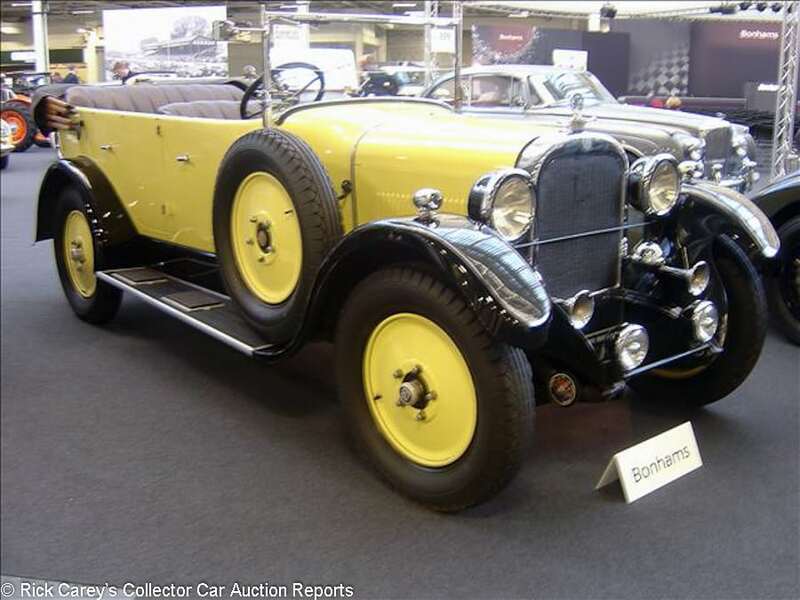 The equipment on this example is impressive, but it is a poseur’s car for which an exceptional price was paid. 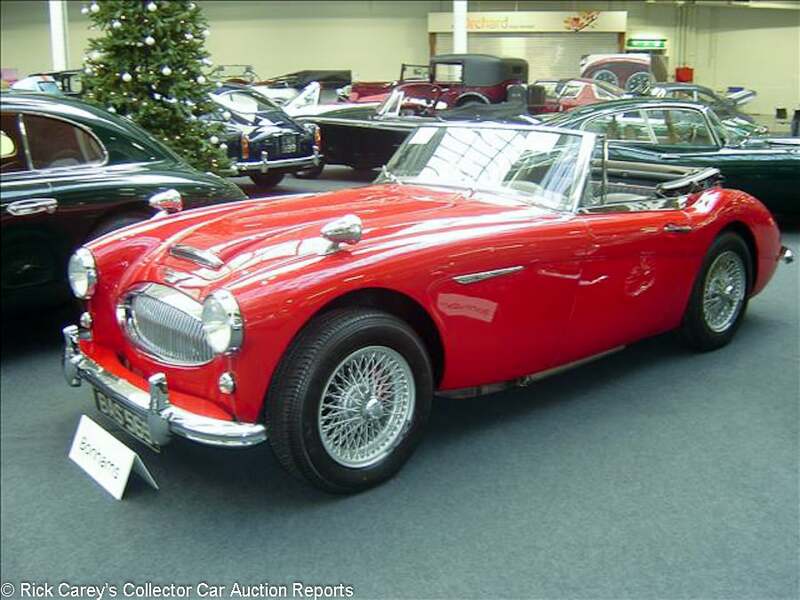 Lot # 156 1964 Austin Healey 3000 Mk III Phase 1 Convertible; S/N HBJ826348; Red/Black vinyl; Estimate $48,420 – $57,339; Older restoration, 3- condition; With Reserve; Not sold at Hammer bid of $38,226. – RHD. Moto-Lita 4-spoke woodrim steering wheel, chrome golf ball dimpled shift knob, overdrive, silver wire wheels, bullet fender mirrors, bumper overriders. – Paint respray is aged. Interior is aged and a tad too much. Silver painted steel wire wheels are dirty and the exterior chrome has many imperfections. Easily improved if the mechanics are in good order, which you would have to check with the story the exterior portrays of the recent owners’ attention. A run of the mill MK III with no strong elements. – Actually rather unusual as a Phase 1 Mk III with the earlier low-slung rear chassis and low ground clearance exhaust but the reported high bid is appropriate for its configuration and condition. 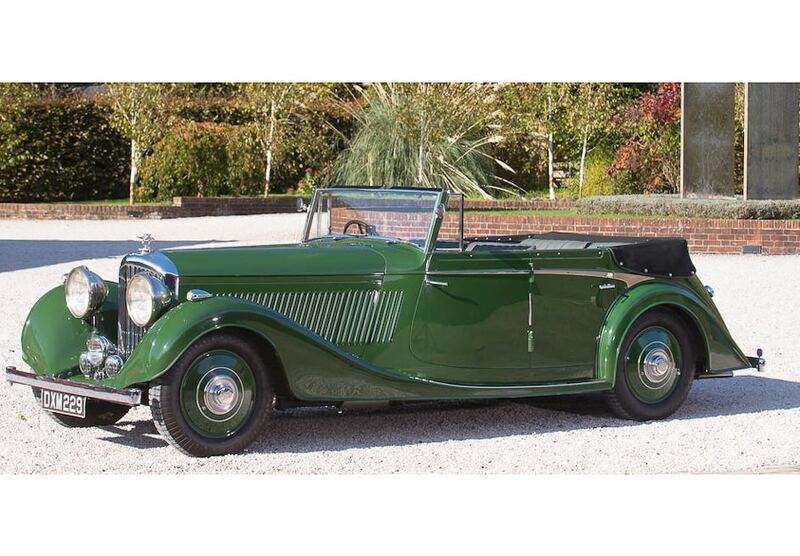 Lot # 157 1936 Lagonda LG45 Rapide Replica Tourer, Body by Northern Lagonda Factory; S/N 12091; Green/Green leather; Estimate $293,066 – $369,518; Rebodied or re-created, 3 condition; With Reserve; Not sold at Hammer bid of $267,582. – RHD. 4,453/134hp, 4-speed, exposed flexible headpipes, dip beam light. – Replica Tourer. Green exterior and interior. The paintwork finish is generally poor and not to a good enough standard for the quality of car. Great potential in an otherwise useable car. – Bonhams confused this car’s description with a similar LG45 Rapide Replica offered at Bond Street two days ago, including the photos and duplicating the chassis and registration numbers. Doh! 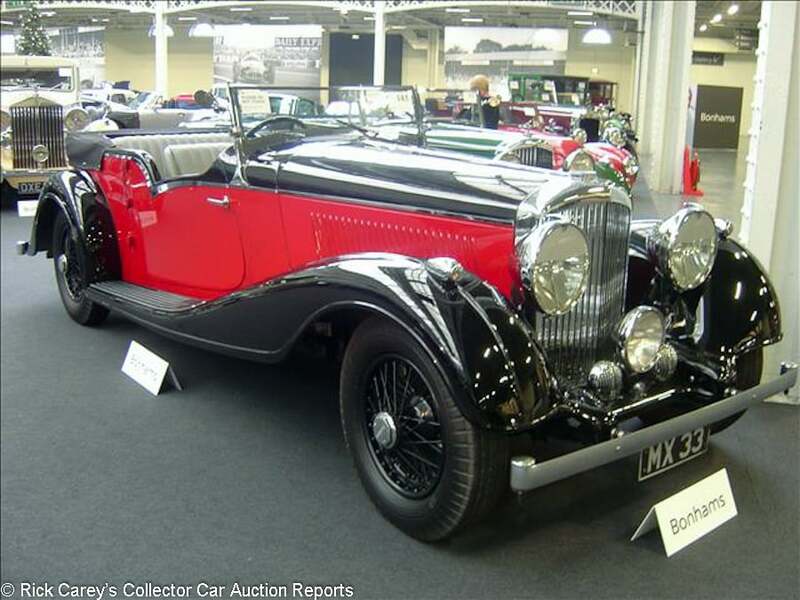 The Bond Street Lagonda, though, was a real Rapide and brought a high bid of $894,040. 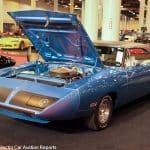 This is achingly close in appearance and performance and would have been a sound value at the low estimate. Lot # 158 1960 Bentley S2 Continental Flying Spur 4-Dr. Sedan, Body by H.J. 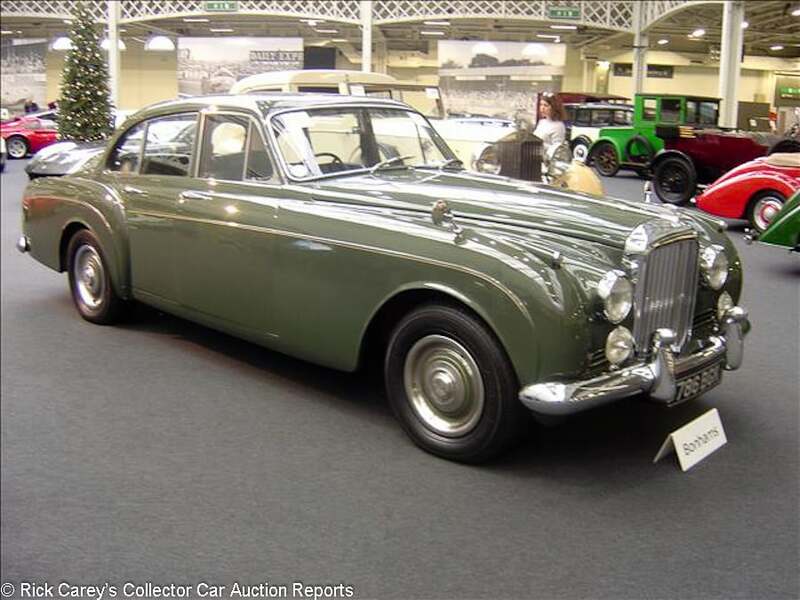 Mulliner; S/N BC145AR; Sage Green/Green leather; Estimate $114,678 – $152,904; Recent restoration, 3+ condition; With Reserve; Hammered Sold at $104,484 plus commission of 15.00%; Final Price $120,157. – RHD. Automatic, fender mirrors, pushbutton radio, hubcaps and trim rings, blackwall tires, fog lights. – Older 90’s respray to a good standard. Seat leather has been redyed. Mechanicals appear original. A pleasing car that would need a thorough check to be trusted but has promise and a solid history file of work done progressively over the years. – Soothingly Sherwood Forest in its livery and attractively presented, this S2 Continental Mulliner Flying Spur is as impressive today as it was fifty years ago and brought an appropriate price for its presentation, originality and preservation. Lot # 159 1926 Dodge Brothers ‘Fast Four’ Tourer; S/N A324590; Yellow, Black fenders/Chestnut leather; Black cloth top; Estimate $25,484 – $31,855; Older restoration, 3 condition; With Reserve; Hammered Sold at $22,936 plus commission of 15.00%; Final Price $26,376. – RHD. Disc wheels, fog lights, luggage rack with wicker hamper. 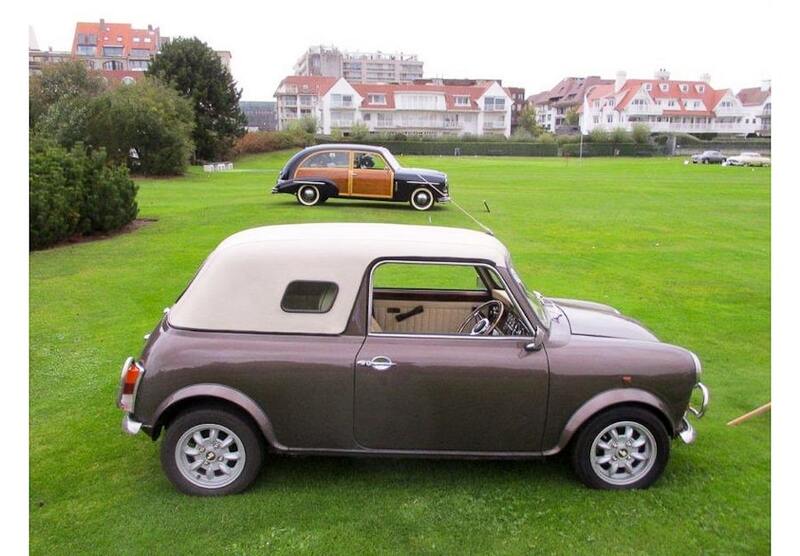 – Only two owners from new, stored from 1939 until 1987, then restored. Named “Dorothy”. Yellow resprayed a long time ago but the paint is in good condition, no obvious paint problems. Chestnut leather in good condition and contrasts superbly. Some exterior and interior details could be freshener but a good useable vintage car with a well-maintained, orderly engine compartment. – This is a reasonable result for an unusual automobile, particularly in the UK. Dodges of this period are noted for their quality construction and rugged performance, attributes that still make them attractive today. 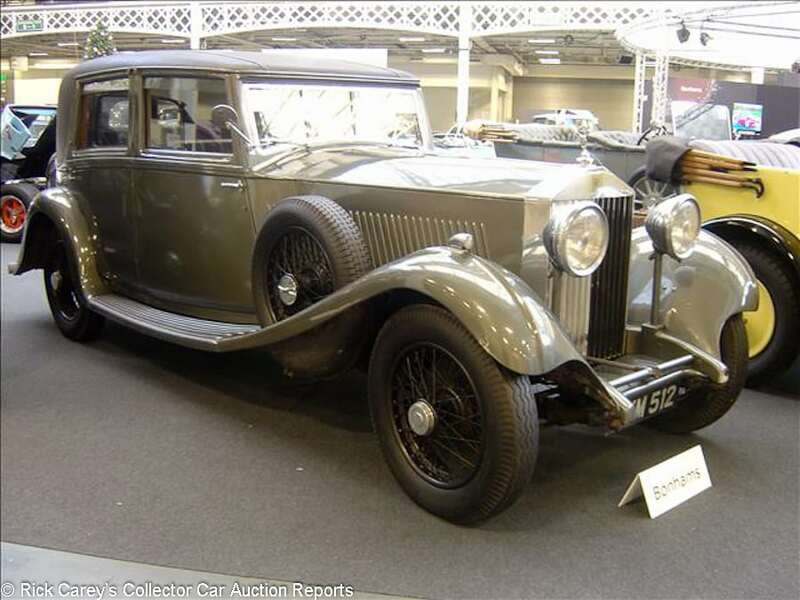 Lot # 160 1934 Rolls-Royce 20/25 Limousine, Body by Barker; S/N GXB25; Engine # M4E; Grey, Black padded roof/Black leather, Fawn cloth; Estimate $31,855 – $44,597; Visually maintained, largely original, 3- condition; With Reserve; Hammered Sold at $31,855 plus commission of 15.00%; Final Price $36,633. – RHD. Folding carpeted footrests, rollup division, smoker’s kits, dual sidemounts. – Motheaten and aged cloth upholstery in the rear, worn and cracked old, probably original, leather in the front. A good general finish, sound interior wood. Tired mostly original engine compartment. Long displayed at the Totnes Motor Museum and in need of much attention. 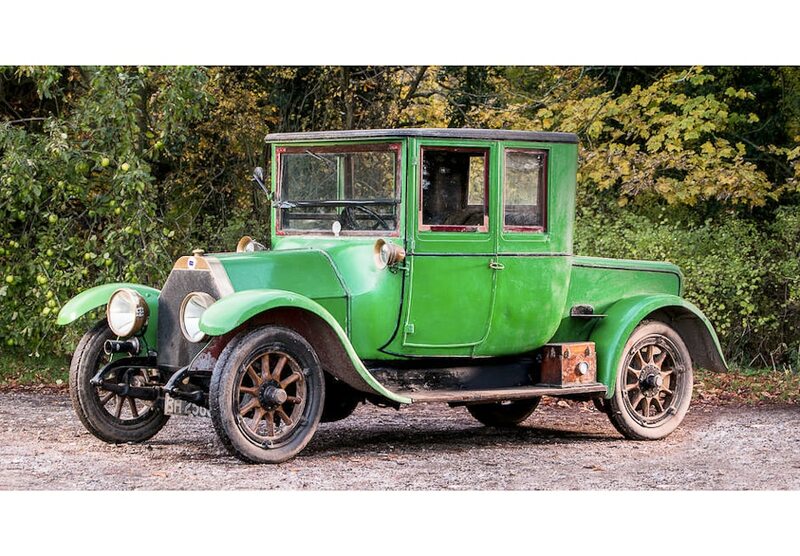 – Unusual formal coachwork on the light 20/25hp chassis with some interesting features and the kind of originality not often seen, this 20/25 needs a lot of attention, however, even if its original features are retained and the seller should be pleased to get this much for it. Lot # 161 1973 Excalibur SS Series II Roadster; S/N 19731214; Bamboo Cream, Royal Maroon fenders, Black hardtop/Tan leather; Estimate $76,452 – $82,823; Older restoration, 2 condition; With Reserve; Hammered Sold at $63,710 plus commission of 15.00%; Final Price $73,267. – 454/270hp, automatic, chrome wire wheels, narrow whitewalls, dual sidemounts with mirrors, air conditioning, power steering and brakes, hardtop only with side curtains, Moto-Lita woodrim steering wheel, driving lights, Blaupunkt AM-FM. – First owned by Dean Martin, documented with the original delivery records. 20,932 miles from new. Restored in the U.S. in 1998 and immaculately offered, impossible to fault other than its mock 30s styling. – Having been owned by Dean Martin it’s surprising it doesn’t have a built-in minibar. Sold by Mecum at Monterey in 2016 for $38,500, then at Las Vegas in 2017 for $31,900 making the result here a home run. In fact, it is such a home run it might be described as a “bottom of the ninth, bases loaded, inside the park, game-winning” home run. This result is an aberration. 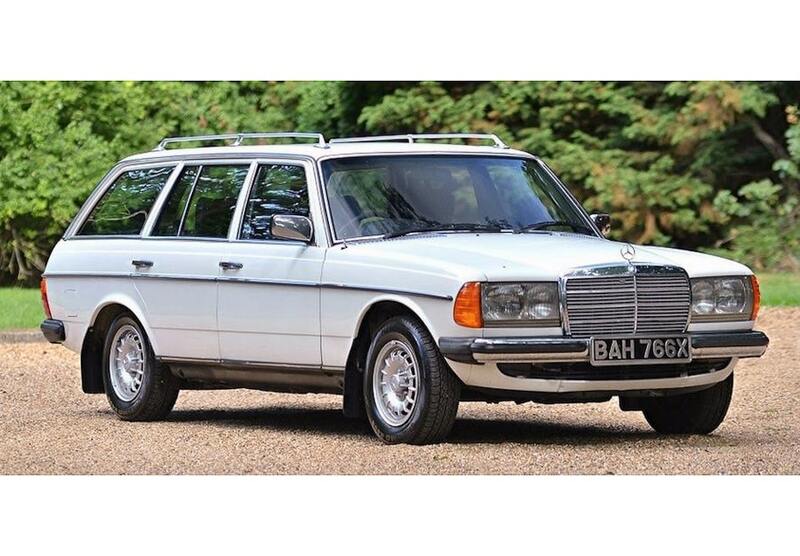 Lot # 162 1982 Mercedes-Benz 280 TE Estate; S/N WDB123098822006088; Chamonix White/Black leather; Estimate $15,290 – $20,387; Unrestored original, 3 condition; With Reserve; Hammered Sold at $14,653 plus commission of 15.00%; Final Price $16,851. – RHD. Automatic, power windows, air conditioning, power windows. – Ex Sir Barry Gibb. Original condition looking car with some signs of age. Just at that in between age where looks can be deceptive. Would need a thorough check to be used regularly. – The celebrity ownership means little and this is a fair price for a practical and durable family hauler, exactly what Sir Barry Gibb used it for during his 29 years of ownership until 2017. 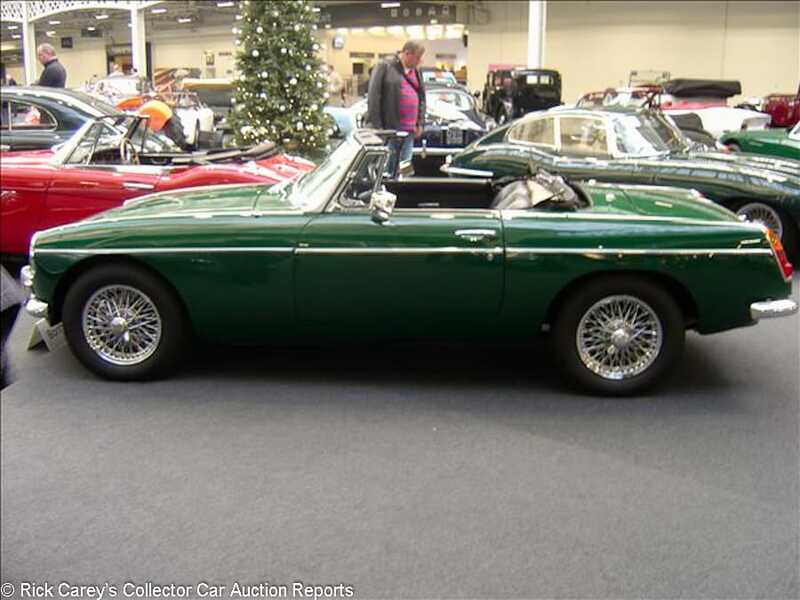 Lot # 163 1969 MG B Supercharged Roadster with Hardtop; S/N GHN4U175501; BRGreen, BRGreen hardtop/Black; Black cloth top; Estimate $19,113 – $25,484; Modified restoration, 3 condition; With Reserve; Hammered Sold at $21,024 plus commission of 15.00%; Final Price $24,178. – RHD conversion. 1,950cc supercharged engine, overdrive 4-speed, stainless steel exhaust, SPAX shocks, Kenwood CD stereo hidden behind the original Radiomobile unit, Moto-Lita leather rim steering wheel, chrome wire wheels. – The bonus of the Moss supplied supercharger is approximately 40 more BHP. BRG paint is bright but surprisingly has imperfections. Rear springs are incorrect, so the rear ride height is way too high, almost nose down. The bonnet and front fender fit is very poor with near half inch gaps. A rushed restoration with more attention paid to the modifications than to the appearance. – The stance of this MG B is really exaggerated but the original springs come with the car and should be slapped back on as soon as it gets to the new owner’s garage. That said, it is a lot of performance for the money, so much so that the bad panel fits and pimply paint can be overlooked as allowed for at this price. Lot # 164 1933 Austin Seven ‘Ulster Replica’ Special; S/N 256071; Engine # M168667; Aluminum/Red vinyl; No top; Estimate $10,194 – $12,742; Older restoration, 3 condition; With Reserve; Hammered Sold at $7,645 plus commission of 15.00%; Final Price $8,792. – RHD. Cycle fenders, Blue wire wheels, naturally aspirated with a single SU carburetor. – Well used tiny sports car. A post-factory conversion, built up from parts. Popular for shorter sprints and hill climbs. A niche UK market for these nimble cars and the younger generation like the drivability. – A fun little piece of fluff, for go kart money. Lot # 165 2000 Morgan 4/4 Roadster; S/N SA944180004D10716; Connaught Green/Stone leather; Black cloth top; Estimate $30,581 – $35,678; Unrestored original, 2- condition; With Reserve; Not sold at Hammer bid of $25,484. – RHD. Chrome wire wheels, Ford Zetec-R 1,796/114hp engine, 5-speed, rear-mounted spare, luggage rack, fog lights, Moto-Lita steering wheel, CD stereo – Correct and original condition, appears undamaged and unrestored with a claimed 44,650 miles from new. 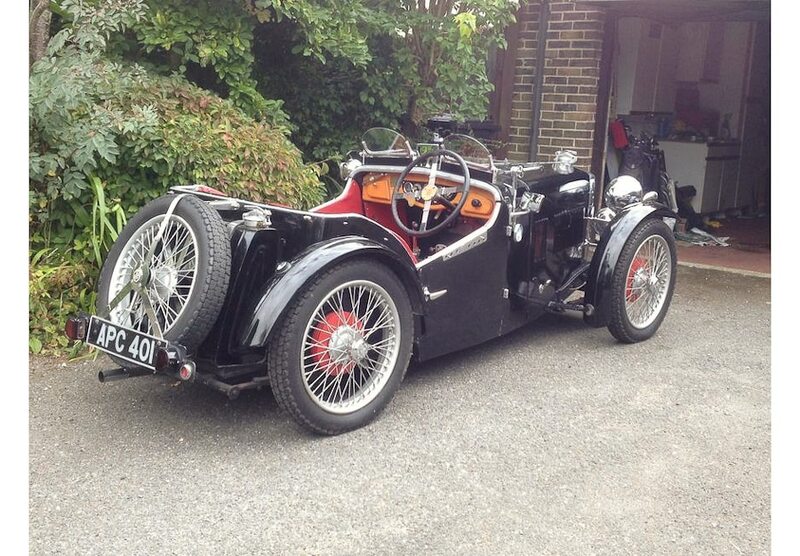 A well-kept modern classic with a desirable registration, W14 MOG. – The bidders weren’t paying attention to the excellent preservation of this 4/4 with the reported high bid and the decision not accept the lowball offer reflects good judgment. Lot # 166 1977 Ferrari 308 GTB Vetroresina Berlinetta, Body by Pininfarina-Scaglietti; S/N 20543; Rosso Chiaro/Black leather; Estimate $140,162 – $178,388; Recent restoration, 2 condition; With Reserve; Not sold at Hammer bid of $121,049. – RHD. Air conditioning, Hitachi CD stereo. – Very good paint but not fresh, some minor swirls. Great interior and the wheels are perfectly restored. The engine compartment looks like new. Progressively but thoroughly restored over the past four years, this is a great car. – It also is seriously undervalued at this bid and could have brought the low estimate without being unreasonable. 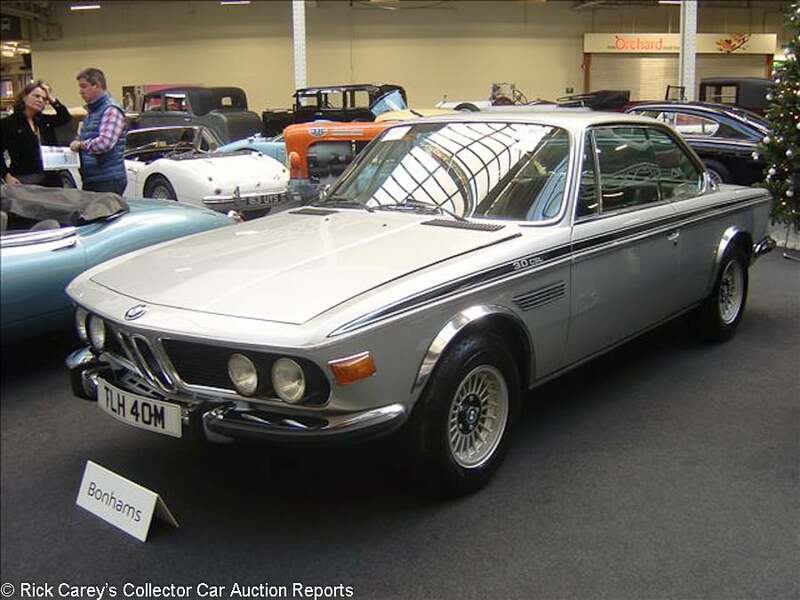 Lot # 167 1973 BMW 3.0 CSL Coupe; S/N 2285482; Silver/Black vinyl, cloth; Estimate $95,565 – $127,420; Cosmetic restoration, 3 condition; With Reserve; Hammered Sold at $81,549 plus commission of 15.00%; Final Price $93,781. – RHD. Power windows, dual cigarette lighters, alloy wheels. – A standard 3.0 CSL, not a Batmobile. New paint but original exterior chrome and alloy trim is pitted and has been refitted without polishing. The engine compartment is nearly like new. An average cosmetic restoration. – Even without the wide wings, air dam and spoiler of the Batmobile this is a valuable car but the bidders seemed to be fixated on some of its age-related flaws and restrained their bidding to this modest result, a safe price for a cosmetically restored example that had its mechanical overhaul done back in the late 20th century. A prudent bid for an attractive car. 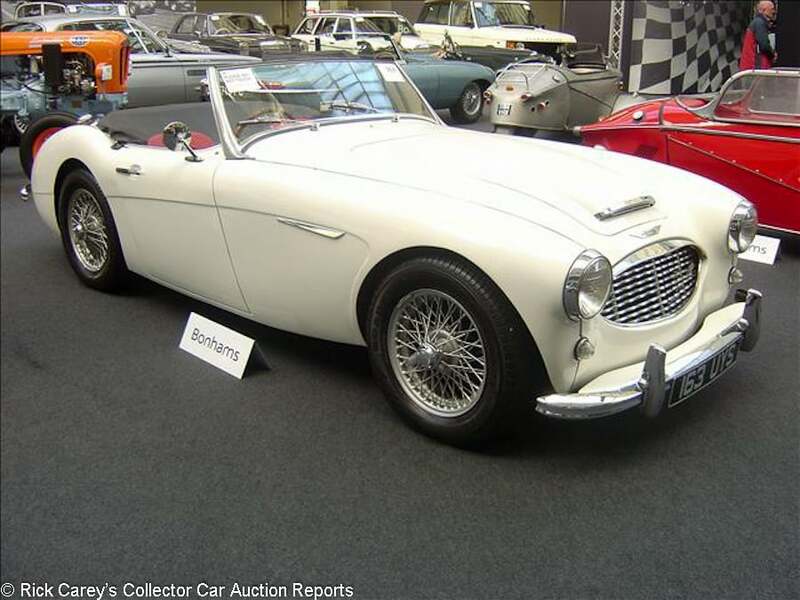 Lot # 168 1957 Austin Healey 100/6 BN4 Roadster; S/N BN4O45824; Old English White/Red leather; Black leatherette top; Estimate $48,420 – $57,339; Recent restoration, 2- condition; With Reserve; Not sold at Hammer bid of $38,226. – RHD. Silver painted wire wheels, woodrim steering wheel, overdrive – Well finished paint, chrome and interior. Wheels and tyres all fresh. The engine compartment is orderly and nearly like new but shows some age and miles. A very smartly offered car which should receive good attention. 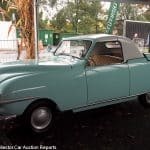 – A reassuring car with an Australian early history far from the damp of England, but even at that it would not have been a bargain at the reported high bid here. 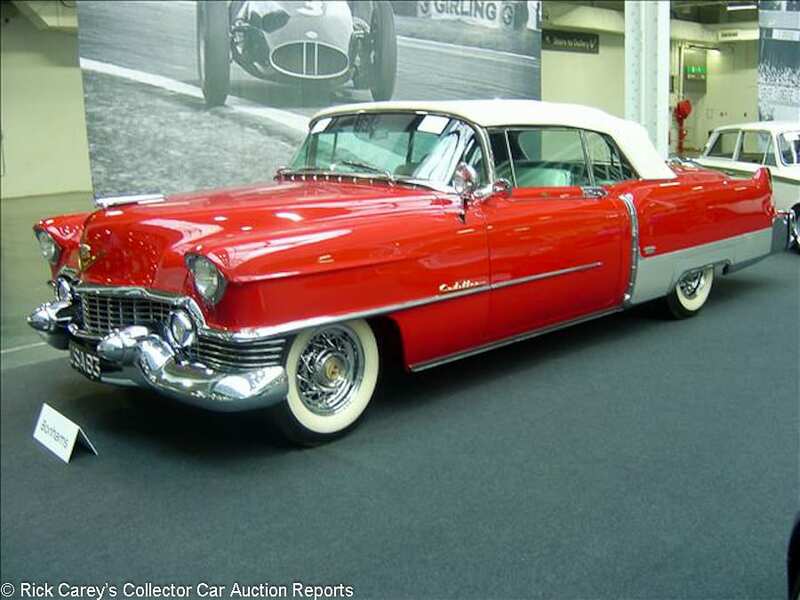 Lot # 169 1954 Cadillac Eldorado Convertible; S/N 546254579; Red/White; White vinyl top; Estimate $76,452 – $101,936; Older restoration, 3- condition; With Reserve; Hammered Sold at $90,468 plus commission of 15.00%; Final Price $104,038. – 331/230hp, automatic, WonderBar radio, chrome wire wheels, wide whitewalls, parade boot, continental kit, power steering, windows, seat and brakes, remote spotlight – Stunningly bright car but on close inspection it has paint marks and imperfections. Cream white hood is dirty and will be hard to make clean. A cosmetic restoration in the 80’s and showing its age as well as stored the last decade. 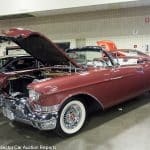 – American cars were the stars of the show here at Olympia, bringing much better prices in the UK than they would in the U.S. where this would be at best a $90,000 car. Opportunists should note, however, that this is a fickle situation and not expect to see it happen often. 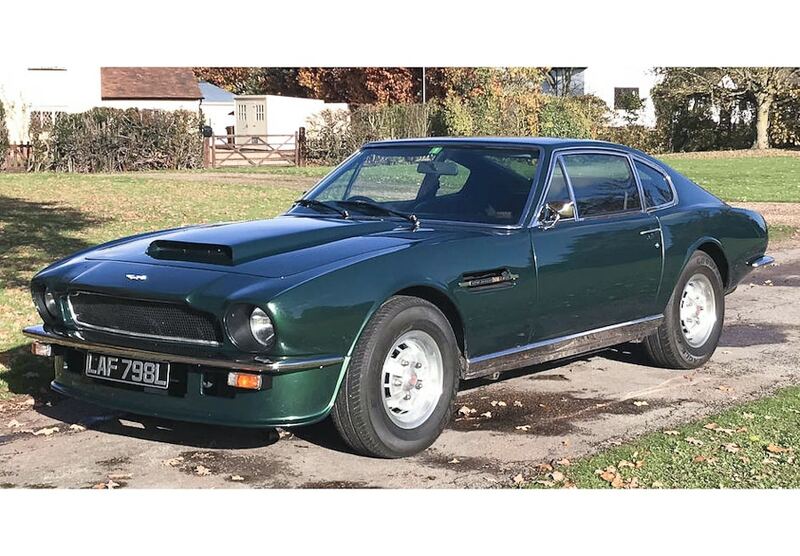 Lot # 170 1973 Aston Martin V8 6.0-Litre Coupe; S/N V810703R; Balmoral Green/Dark Green leather; Estimate $101,936 – $127,420; Modified restoration, 3- condition; With Reserve; Not sold at Hammer bid of $86,646. – RHD. 6-liter upgrade, Weber carbs, ZF 5-speed, AP brakes, rebuilt suspension with Koni shocks, alloy wheels, Goodyear tires, Radiomobile 8-track stereo – Slightly worn look about it. Poor masking showing overspray, a lack of detail. Could easily be improved, but not inexpensively, although it promises to be a stimulating driver. – It would be reasonable to take this AM V8 on steroids home at the reported high bid, but not at much more than was reported here. 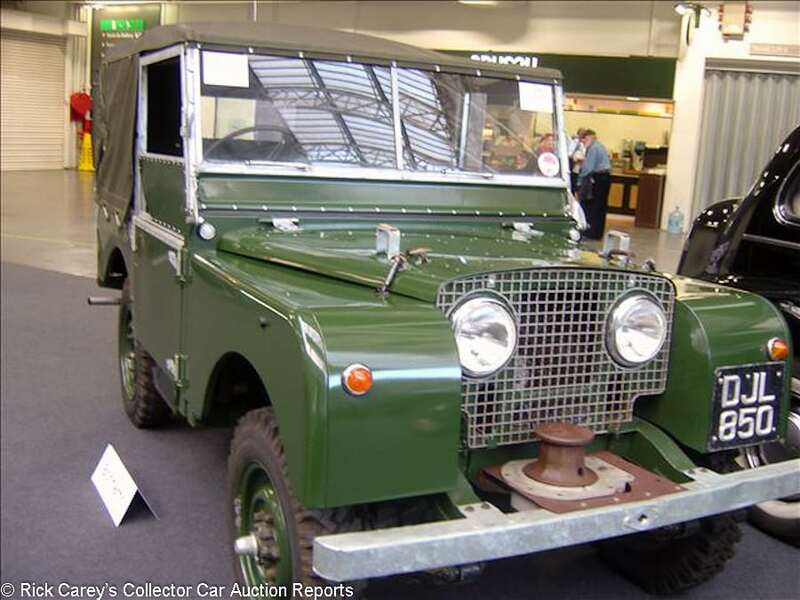 Lot # 171 1950 Land Rover Series I 80″ 4×4 Utility; S/N 16101132; Bronze Green/Green vinyl; Olive canvas top; Estimate $25,484 – $31,855; Truck restoration, 3- condition; With Reserve; Hammered Sold at $21,237 plus commission of 15.00%; Final Price $24,423. – RHD. Steel wheels, off-road tires, center-facing rear seats, – Traditional army green average to poor painted body. Basic vinyl seats. Clean general condition for a working car. Very loved in the UK and as ruggedly practical today as it was almost 70 years ago. – Grouse hunting in Britain or on safari in Africa this is the quintessential Land Rover before it became domesticated for soccer moms. It’s a neat value at this price, good enough to drive proudly, but not so good that it can also prove its creds in the moors and mud. Lot # 173 1964 Mercedes-Benz 220 SE 2-Dr. Hardtop; S/N 11102120052525; Silver, Blue roof/Grey leather; Estimate $20,387 – $28,032; Older restoration, 3- condition; No Reserve; Hammered Sold at $9,557 plus commission of 15.00%; Final Price $10,990. – RHD. Hitachi multi-band cassette stereo, 4-speed, fog lights, fender mirrors – Represented as 7,462 miles and two owners from new. Average paint. Worn original leather seats with surface cracks. Hard to get perforated leather remade to the same standard. Clean and orderly but original engine compartment. Dirty carpets. A choice original example of the great driving 111 coupe. – The bidders overlooked the originality and focused upon the age, not unreasonably since it hasn’t been used for years. By any standard, though, it is a serious value at this price and after being spiffed up will light someone’s fire in the next months. 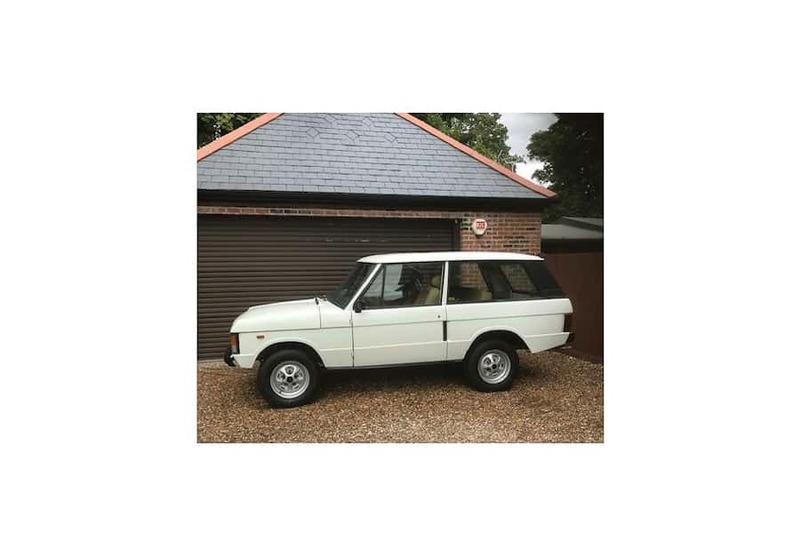 Lot # 174 1980 Range Rover ‘Classic’ Utility; S/N SALLHABV1AA104400; Arctic White, /; Estimate $16,565 – $20,387; Recent restoration, 3 condition; With Reserve; Hammered Sold at $12,742 plus commission of 15.00%; Final Price $14,653. – RHD. – Off white with all new beige biscuit interior and carpets. Average paint with a used looking interior, for example a very worn brown leather steering wheel lets the rest of the fresh interior down. – Superficially redone with surface cosmetics, a Range Rover that deserved the bidders’ skeptical reception and this result. Lot # 175 1990 Bentley Turbo R 4-Dr. Sedan; S/N SCBZR04A2MCH334245; Grey Metallic/Light Cream leather; Estimate $19,113 – $25,484; Competition restoration, 3+ condition; With Reserve; Not sold at Hammer bid of $14,653. – RHD. Air conditioning. – Represented as 66,920 miles from new and recently serviced. Seats need a wipe clean otherwise superb, no wear. Burr Walnut all looks superb. A good car from the unloved squarish era. – Bring a dirty car to the auction and expect it to be passed by the bidders. Lot # 176 1935 Humber 16/60hp 2-Dr. Sedan; S/N 1610986D; Black, White/Red leather; Estimate $15,290 – $19,113; Older restoration, 3+ condition; With Reserve; Hammered Sold at $7,645 plus commission of 15.00%; Final Price $8,792. – RHD. Dip beam light, fender mirrors, suicide doors, luggage trunk, electric water pump. – Average wedding hire car paint with good red leather interior. White and black matching wheel discs. All original other than modern water pump. Caring owner. Cheap classic. – There are worse ways to take the family out for an ice cream on a summer weekend evening, but few are as reasonably priced as this. Lot # 177 1938 Daimler EL24 Limousine; S/N BN5308; Blue, White/Black leather, Grey leather rear; Estimate $12,742 – $19,113; Older restoration, 3- condition; With Reserve; Hammered Sold at $7,645 plus commission of 15.00%; Final Price $8,792. – RHD. – Blue and white average paint over worn and slightly dirty black leather and black carpet. Blue painted wire wheels look wrong. The engine compartment is scruffy but not neglected. Another low price classic. – A superfluous wedding hire car turned over for appropriate, even generous, money. Lot # 178 1924 Wolseley 11/22hp Drophead Coupe; S/N 786A2755; Light Blue, Blue fenders/Green leather; Black cloth top; Estimate $15,290 – $20,387; Older restoration, 3 condition; With Reserve; Hammered Sold at $15,290 plus commission of 15.00%; Final Price $17,584. – RHD. Single sidemount spare, black wood spoke wheels. – Convertible with dickey. A charming but seriously aged old restoration and an odd combination, even more odd-looking with the top erected, but attracted a good price, roof goes down, price goes up! – This is a chance not only to have the only one like it on your block, but in your region, and the bidders responded to its cheeky style and overhead camshaft 4-cylinder engine with some enthusiasm. Sold at nearly the end of the day it did better than it had any real hope of doing but isn’t unreasonable. 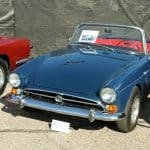 Lot # 179 1970 Triumph TR6 Convertible; S/N CP5158401; Dark Blue, Unfinished hardtop/Black vinyl; Black leatherette top; Estimate $6,371 – $12,742; Older restoration, 3- condition; No Reserve; Hammered Sold at $10,703 plus commission of 15.00%; Final Price $12,309. – RHD. Alloy wheels, two tops, overdrive 4-speed. – Original worn black leather upholstery. Desirable manual with overdrive. Comes with a factory made steel hardtop in primer. 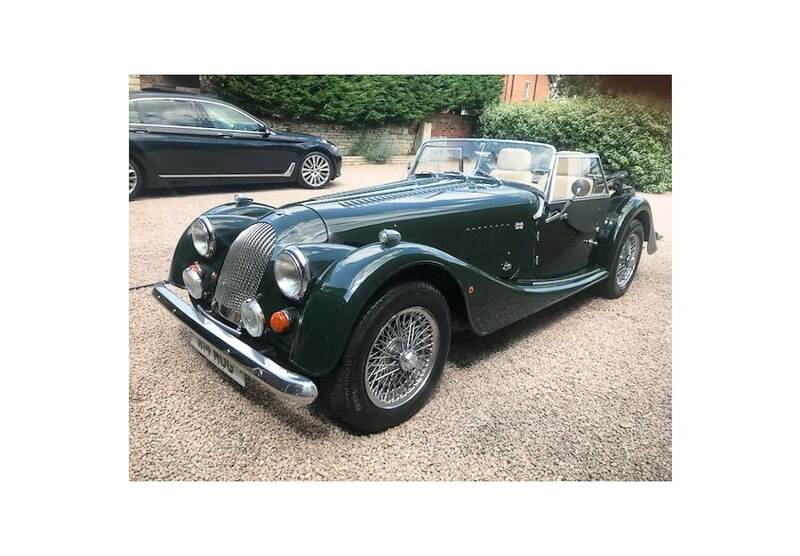 Seller says the car deserves finishing better which is no surprise as its restoration was completed 29 years ago and it has sat in storage since then but has recently been returned to running (but not much more) condition. 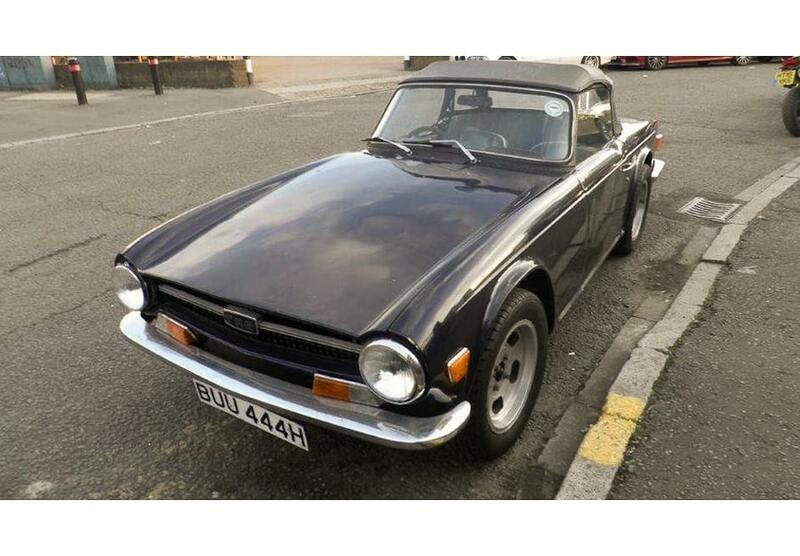 – The bidders liked this TR6 better than the consignor or the auction company, based on the pre-sale estimate range. It’s a project, but one that can be completed without an overwhelming investment. I too remember in the 1970’s seeing exotic sports and high quality marques for sale at regular dealerships amongst all the family cars. Rick will tell you that even back then some commanded a price proportional to a years income, a family home or more. Add to that compounded yearly inflation and it gets tricky to judge values from then to now. This is the beauty of Ricks reports. They give the market a context, a yardstick and a compass. All that said, like a kid playing a Top Trumps Dragster pack, I love the pictures of cool cars! Hi Chris. Yes, times have changed but for many a $25K Ferrari (and similarly priced house) were more attainable; esp. when both were on the secondary market. Keeping one going was never cheap. Watching them go down hill was never pleasant. There’s a lot of big money chasing too few cars these days = classic inflation. The resultant rescue of scruffy examples has been good for the hobby. 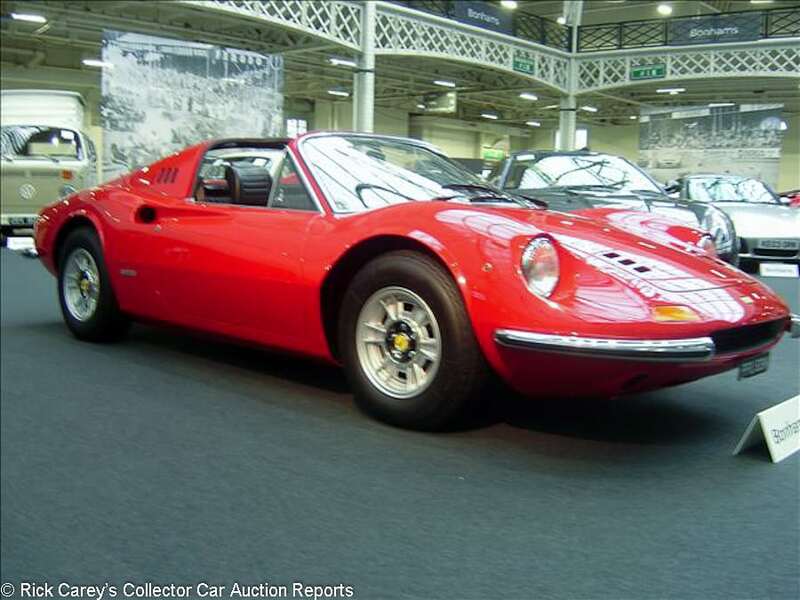 I wonder what the recent deflation in the Ferrari Dino market is all about? I agree Mark, Yes, there’s such a lot of great cars that were within reach. It’s a regular subject with my friends and at car meets. Dino values are a great example. 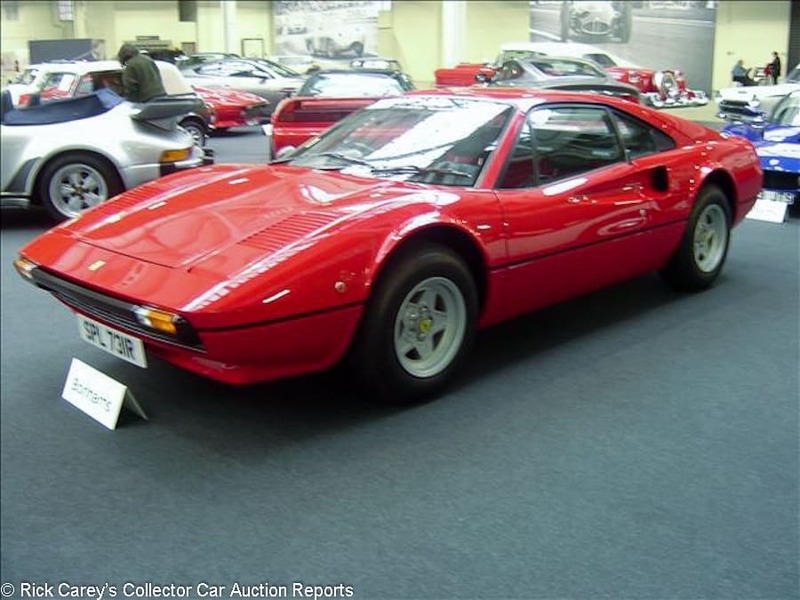 We know that technically they weren’t sold as Ferraris initially but are widely accepted as such now. They were an entry level price but we’re prettier and better handling than some of their more expensive siblings. They were clearly undervalued for a long time but have recently risen to their current high ceiling. Inevitably there will be some falling back from that high but they’re gorgeous and will gain again in the long run. Like you I’m lucky enough to be around these beauties. I’m glad that interest in classics and the vintage era in general has captured the hearts of a new generation. As a teenager I remember going to Vintage car meets with my Dad and all the owners were these funny ancient characters. I’m pleased that these great cars are still loved and appreciated. It’s great for the classic car business. Every time I drive my classics is a memorable experience. Moderns can’t compete with the presence, style and panache of a cool classic car. The younger me didn’t need to worry who would want them, their future is in safe hands. Fascinating to see these results as a reality check against the Retail/Dealer prices seen in the Brit car magazines some of us (still) read. This auction seems to have a Wholesale air to it, no sentimentality going on. Cars like the two AM V8’s seem very cheap, although maybe they needed sills and other spendy repairs? Thank you for your support and yes, you raise an interesting point. There was a fair sale rate and yes, many of the prices seemed good value. Of the two Aston Martin V8s, the white one particularly sold for a bargain price but the green model didn’t sell. The white model being an automatic and a left hand drive doesn’t appeal to UK buyers but more than that it was simply dull, it just didn’t appeal. 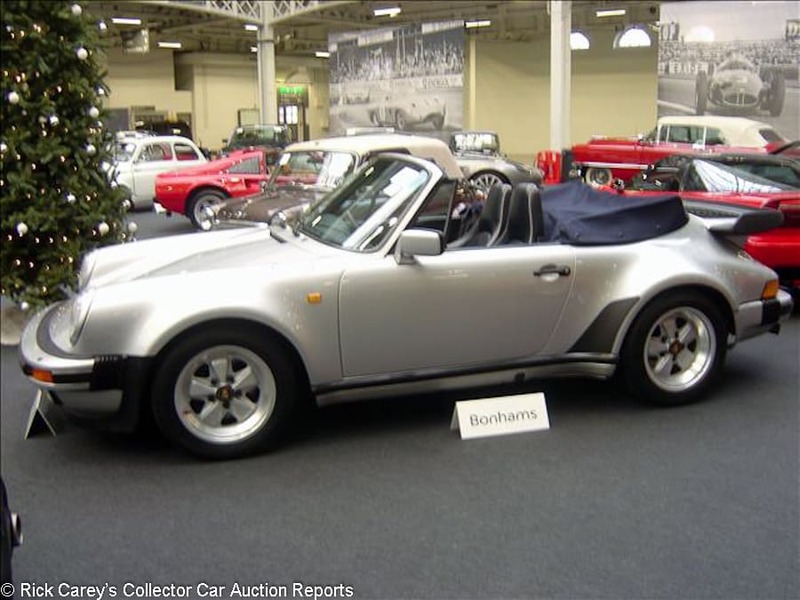 The UK dealer prices will always be higher than a classic car auction. The high end dealers offer only the best cars that a buyer knows have been thoroughly checked mechanically. You get a warranty, part exchange, test drive and you can take it back if you’re not fully satisfied. None of those luxuries apply at a classic car auction! That’s why a lot of the buyers at classic car auction are traders. They’ve got the experience and facilities to put right any issue with a car. In summary, UK classic car retail prices are high as wealth and incomes are relatively high. Dealers offer a high quality service to monied buyers. Everybody wins!